Thanks to mother nature, only one of the original 2 100 metre wires of this aerial remains in the air. January 2005: Mother nature takes remaining wire... and the 25 metre tower! February 2005: 100 metres of wire at 10 metres average height. December 2010: 100m at 12 m average height. April. 13 Garry reported a 4* detect. Much QRN this time of year. Markus is decoding many 'watts' across the pond. 14th. Power reduced from 10 to 5 watts and EbNaut message changed accordingly. 16th. 1943: monopole replaces iced down rotated L. EbNaut continues and is seen on DF6NM autodecoder. 1st. Memorial message on Ebnaut copied by Gary and Markus. Resumed at 2130 today. 24 hr operation. 2nd: Garry could decode until 11ut. Local sr/ss 1011/2116 ut. Garys sr 1227. 4th. QRT to chase dx on 160m at 0600. Garry noticed this! lots of strong decodes at iz7slz, dl0ao and df6nm, up to 30 dB Eb/N0. QRP starting tonight. 7th. Michel F5WK reports good copy of the QRP sigs. Garry got a ******* but was otherwise troubled by QRM. Autodetectors at DL0AO and DF6NM were busy getting good decodes. 9th. Garry gets a decode at 0800 despite the QRM. Impressive! 11 and 13 dB Eb/N0 peaks at DF6NM and dl0ao. 18th F5WK reports good decodes in the moning. 2 April. forgot to switch from mf to lf last night. The 1 watt ebnaut on 137.477 kHz didn't go far. Hopefully it will return on the DL0AO and DF6NM autodecoders tonight. 1st Decodes reported by K3SIW and W1VD on the 2nd. TA receptions at DN6NM continue regularly. IZ7SLZ auto active but no decodes recently. The TX will remain on (200 watts, 2 amps RF) until Monday am. 3rd. Nice report from DF6NM autodecode: "137477 Hz file start time 2019-02-03 00:52:48.810 found VO1NA-* list rank 0 carrier Eb/N0 18.50 dB Eb/N0 from symbol errors 16.4 dB"
IZ7SLZ gets 2 decodes, this one was close to the limit: "2019-02-03_04:00:00 137477.000Hz N=7 T=3s 8K19A CRC=16 list=10000 sym=608 Duration=1824s T_OFFSET=0.0s F_OFFSET=0.00000Hz Nsymbols = 608 decoder length: 77, states 262144, QK 19 QD 8 initial reference phase 43.3 amplitude 1.356e-01 path metric: 4.4582967e+00 carrier amplitude: 1.020e-05 carrier power: 1.040e-10 total power: 1.124e-06 total noise power: 1.124e-06 carrier phase: 2.8 deg carrier Eb/N0: 0.1 dB carrier Es/N0: -11.76 dB carrier S/N: 16.07 dB in 548.2 uHz, -16.54 dB in 1Hz, -50.52 dB in 2.5kHz bits per hour: 78.8 Shannon capacity: 111.6% bits/hour Shannon efficiency: 70.5% Code weight: 282 found rank 1310 ber 3.6513e-01 Eb/N0 -0.4 M -4.458296299e+00 ph 1 180,180,180,180 [VO1NA-*]"
4th Good decodes from Garry K3SIW and Riccardo IW4DXW. TX is on again tonight. 1 Decca module. 6th. Decodes at K3SIW and DF6NM. 7th. Domenico IZ7SLZ notes no modulation... A problem on this end! Wrong time was given to Ebkey! 10th Aluminium halyard anchor replaces the brurnt wooden one on the tower and the big 20x100m RL is raised again. It's on the air tonight. Sigs seem stronger on autodetects and spectrogram. 9 Feb. 2019. K3SIW: good decode. 11th: Riccardo IW4DXW noted stronger sigs. 13th. More reports from Riccardo who is doing some rx experimenting. Garry reports very strong signals from last night. 13-14th. Running 2 Decca modules to the RL. 500 watts 3.8 amps RF. Autodecodes IZ7SLZ 14.6 dB. DL0AO 26 dB! K3SIW decodes no longer plagued by QRM. A spectrogam was sent by Daniele Caccia SWL I55387FI showing sigs on the right freq. using a TS 450-S and a Mini Whip. 15: K3SIW: decoded easily in QRM. 16th. IZ7SLZ had a mains failure and lost some data, but got a decode last night. Garry K3SIW got another batch despite QRM. Perhaps its time to try to receive again. 17: strong sigs at I55387FI, More decodes from K3SIW. 0030 ut 23dB Eb/N0 at iz7slz 19th DF6NM reactivated his autodetect wiht decodes from this stn. Decode from K3SIW again. Running 3 Decca modules to the big RL. 20th. Garry gets decodes every hour in QRN/M. 30,31. EbNaut decodes from DK7FC K3SIW and W1VD in QRM. Decca still on 1 module with 200W output to the monopole. 26 Decodes from Garry and Markus again. Carrier was off for periods to use tower for 160m. Class E amp (Vdd set for 20W out) now in service to give the Decca a rest. 24,25th. Good decodes by K3SIW despite the heavy QRN fron the gulf. Autodetects at df6nm and dl0ao again. 23. Decode by Domenico IZ7SLZ and more from df6nm dl0ao. 20 Jan. Playing with carrier on 137.477. Then: LF: 137.477 kHz 7 Chars, 8K19A, 3 s symbols, 608 symbols, starting 1900 ut and at 1 hr intervals, 40 watts to the monopole. Good decodes from DF6NM and DL0AO (autodecode), Garry K3SIW and Rob K3RWR. 1 Dec. Start Opera32. 50 watts 137.477 kHz to big rl. OPDS detections at DF6NM and IZ7SLZ. PSKR: 2E0ILY EB8ARZ PA0RDT. This is the first LF opera transmision since November 2016. DOCXO, AD9850, arduino uno, TC4426 keying the IRFP260n class E tx using a python script on a raspi3. 3rd reports from Domenico IZ7SLZ and Graham G0NBD who marvelled that the EB8 got a daytime reception. Several spots on psk reporter 2E0ILY G0LUJ EB8ARZ SM2DJK PA0RDT PA0LSB. 4th. Bernd, DF9RB reported on 10 receptions peaking -32dBOp at 0600 at DL0AO. Stefan DK7FC sent similar report. 5th. Checking out the 7400 XOR modulator module. Evidence of phase shifts seen on Markus spectrogram. 6th Try Ebnaut. DF6NM reports reception of a frame from K3RWR and 'HHERTZ' from here at 2300. Running 50 W to big rl. Now try 10 watts... Then 4. Decodes by IZ7SLZ, W1VD, VE2IQ (Carrier detect),K3SIW and DF6NM and W1VD who decoded the QRP (4 watts) transmissions. 7-8th: EbNaut 50 watts, 7 chars, 8K19A, 608 3 s symbols. rx at DF6NM,K3SIW,DL0AO (137.477 kHz, 7 Chars, 8K19A, 3 s symbols, 608 symbols, starting h:00 ut) 17th. Continuing wiht EbNaut. The class E TX is holding up well. Received by DL7FC, the EbNaut autodetectors at DF6NM and DL0AO. Report from Marco DD7PC for the transmissions on the 14th. 18th. High SWR and Hot heatsink on TX... aerial had been grounded by wx (ice,wind). Last EbNaut message rec'd at DL0AO at 0700. Here's the low power setup before the gps upgrade. Centre: B+ set to 20 volts with variac on the power supply as seen on meter. Below an arduino programs an ad9850 via 10 pos'n switch. The dds is clocked by an oscilloquartz 10 MHz DOXCO. Front of dds: BPSK modulator module comprising a 7400 configured as an XOR gate with leds showing in and out. Front of modulator: 2n222 and tc4426 keying and driving stages; left: a class E 100w TX for 630m, collecting dust awaiting revised RBR4 at the moment) left: Admy. Patt. key. Above: class E for 2200m. Same one used in 2003 experiments but sith IRFP260 instead of IFF640 hexfet. The former has a lower fatality rate. 19th. Big RL tangled in tree tops by wx. Clipped the tower tap on coil; carrier restored 1500ut. and this summary. 21st: daytime copy on grabbers. 22: gps disciplined carrier at 2015 ut today. 23rd good copy at K3SIW. 25th: EbNaut messages copied by K3SIW and W1VD. 26th. 18 dB Eb/No Rank 0 report from K3RWR. 29th TX off 2300ut. Scaled the hill in a raging blizzard at night to switch from LF to MF. 29 Nov 2018. Switched on the power supply for the home brewed amp and continued with the 50 watts QRSS30 traNsmissions. A fortnight ago, the far halyard on the big RL failed, bringing latter to the ground. Feeding the tower with the Decca caused the far halyard on the low (VLF) RL to fuse, bringing it to the ground too. Also had to fix a mess of charcoal that was once a cleat anchor. 30 watts of VLF back on to the low RL and 50 watts on the big RL again. Strong sigs seen on N1BUG grabber without amp during test transmission using just the tc4426 driver connected to the coax! 18 Nov 18. The far halyard was replaced. 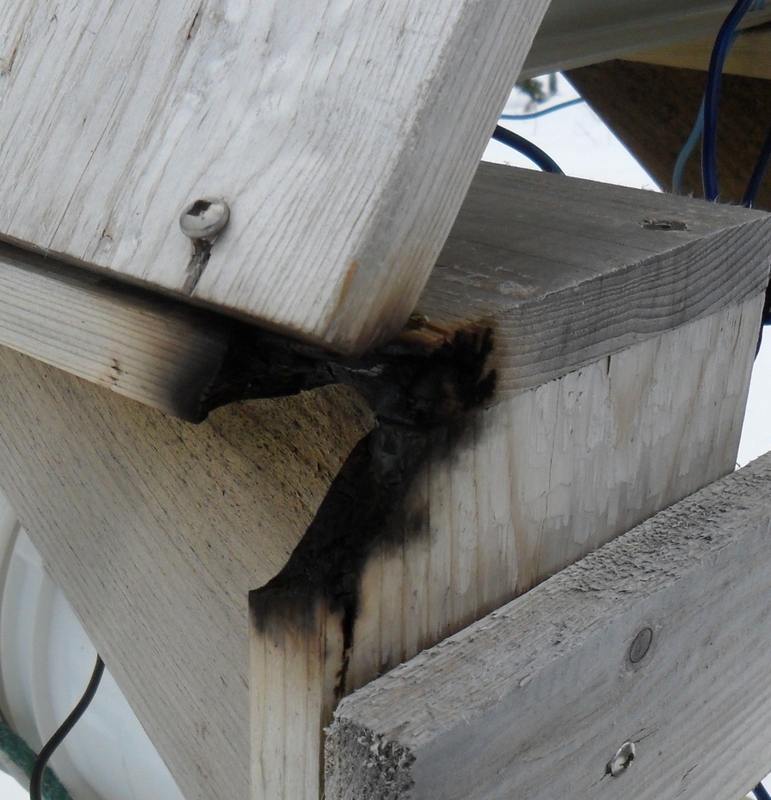 The burnt halyard of the low RL was repaired and the insulator raised again. Energising the tower with LF when the big RL is down is not kind to the VLF halyard. Tuned the coil back to 1.7 mH from 2.6 mH and ran the Decca on 137.777 with some QRSS30 and QRSS60. 2 November 2018. 1 or 2 modules of the Decca to the high RL (20x30m) 3rd. switched to CW on 136.5 kHz following report from Roelof that the QRSS was audible. Markus' high resolution spectrograms showing 5 nights of carrier and one of QRSS100 with th keying sidebands just visible. Markus sent this capture from the club station DL0AO. Meanwhile to the west, Gary K3SIW captured a few letters. And to the East, Alex RN3AUS does well too. The QRSS on 1 Nov was sent with 1 module of the Decca; about 150 watts, 2 amps of RF to the antenna. 4th: CW ended when a windstorm severed the far end halyard and shattered an insulator. The rotated "L" is in a heap on the ground. Fortunatly Roelof was recording: PA0RDT audio Linrad, 12 Hz SDR, Miniwhip. 5th: N1BUG reported clear cw reception at time last night. The tower was used without top loading but was base loaded with 2.7 mH. 2 Aug. Continuing with 4 watts on 136.4 kHz to the big rotated L. Copied by VO1FOX at Signal Hill. 9th VO1LM heard weak sigs. 2200ut. Remote rx Whitbourne: rx with ft817: burhans+ loop sm6lkm converter and pa0rdt mw. No copy with mw and 817 or lkm + eco whip or lkm+loop. Latter 2 appear to be limited by noise. 9 July 137.777 kHz QRSS100 200 watts to big RL. Captured on DF6NM grabber along with R7NT who was up 0.5 Hz. 10th 4 watts 136.38 kHz CW to big RL. Aerial earthed 12th, 15th. 13 June 2018. QRSS100 on 137.777 kHz starting ~0015. Seen on DF6NM grabber. 21 March. A few days testing on 137.777 kHz started as soon as the aerial was raised. Moved to VLF (8.270075 kHz) tonight. DF6NM capture for 01 July. 01 Jul evening: A Canada Day message was sent. It was copied by DF6NM DJ2JP and PA0RDT (audible in 15 Hz). 15,17 July. 2 or 3 Decca modules feeding the 10x100m RL aerial QRSS100 on 137.777. IZ7SZL gets a strong peak after 4 hour integration. Joe DF2JP gets a weak trace of the sigs amd reports were received from G3XDV,PA0RDT (audible) and Vinny DL6II. This was a 20th anniversary event with several EU stns transmitting to comemmorate. 28,29 June: QRSS100 one and 2 decca modules respectively to the small RL. The far tower holding the big RL that collapsed during the 159 kph wind gusts last winter has been fully erected again. An eyebolt that was sheared off last winter has to be replaced on the main tower. March: 2nd CW Beacon 3 amps on 136.5 kHz. 2300 utc. Heard by VO1DV in Foxtrap but nil at VO1UG, VO1VCE, VO1UL. 10th. Markus reported on the carriers for the past 3 nights. 'It is well visible all over Europe, e.g. on Chris' uHz grabber in Bucharest. He noted the first was about 2 mHz high. The Raspi3 was not following commands to disengaging the AD9851 clock multiplier. 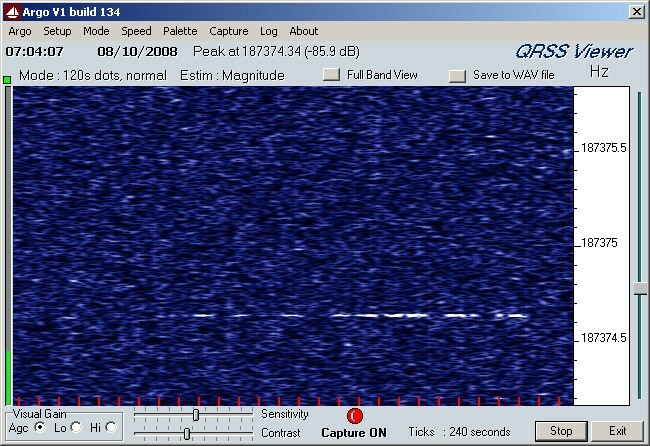 A uno was used and the carrier is near the expected 137.7770002 kHz. The clock is a 10 MHz doxco. 11th. Trying again for a distance record. 3.6 amps. to the big RL. The attempt to link the antipodes was brought to a halt when the 50' mast supporting the far end of the big RL came down in 158 km/hr gusts. 12th: ad9850 comparator output via 4426 to the decca. Using a box from the Loran site (formerly used for freq calib). between the MAR3 and the DDS clock input. The output now seems clean on the NM grabber. 17th. testing ref osc amp(2n3904, 74LS04) ad9851 & raspi3. checking on df6nm grabber. Good line on 137.77701 kHz as expected. Misc tests of DOXCO amp, dds, rpi3 software -- seems all ok on df6 high resolution grabber. 01 Jan. ~200 watts from 1 decca module to the big RL. High SWR due to ice on the aerial. QRSS100. Thanks to instructions, software from Markus, the EbNaut messages received here using spectrum lab were decoded on this side of the pond today. The messages were from DF6NM and IW4DXW. Tangles is delighted to get a reply from Gizmo at last. 2nd. Joe DF2JP forwards specrograms showing very good copy of today's 150 W QRSS100 transmissions to an iced wire. RX,SL, rsNTP is set up for sigs from DF6NM IW4DXW and IZ7SZL. 3rd. Running Pauls ebnaut_rx and Markus ifft and viewer resulted in a decode. Still working on the other 2. RX setup. SW beverage (bidirectional) LF10 preselector FT817 and SL etc. 5th. QRSS100 137.777 received by DL4EAI tnx to DF2JP. 7-8th Report of traces nr Moscow from RN3AUS. R7NT reported traces by EW6BN and RN3AGC. Also seen on the SP5XSB grabber. Strong sidebands at 0.1 Hz on grabbers of DF2JP DF6NM, H. Wolff. AD9850/arduino/2 Decca modules, 3A RF to 100m RL at h~20m. 8th. 2100~2300 then QRT following apparent arcing. 12th. Repaired burnt halyard. Damp nylon, RF + wind are not a good combination. Traces near Moscow reported by Alex RN3AUS and a very good copy by EW6BN Yuri. December. BPSK experiment. TNX DF6NM. The signal spectrogram is centred the current's frequency of 137777 Hz, for 20 less than t lss than 32 hours with phase reversals at intervals at T=5(t-10) seconds. PSK frame period increases linearly with time at 5 seconds per hour. 2nd: EbNaut sigs received by DF6NM, DK7FC and detected by IZ7SZL. Tonight try 1s symbols and Domenico reports 3 decodes, Paul grinds some additional wav files and gets more deoodes. 4th. Try a pilot tone (raspi1B + DDS60 (AD9851) and get a partial of G3XDV. 9-11th. Trying (with much assistance) to receive ebnaut from DF6NM. (137490 Hz 8 characters, 8K19A) Success: a .txt file from Spectrumlab was decoded by Markus after tinkering with the time and frequency of the recorded signals. Amazing! 24th. Seasons greetings sent on 137.777 kHz. 30 Dec. Ebnaut sigs copied here using Spectrum Lab/ Ft817 and LF10 , Beverage. Markus processed text files to decode his signals. rsNTP was inadvertently not engaged. 31. Another reception experiment. Success reported by Markus who reported that DF6NM AND IW4DXW were decoded in the txt files received here. Seasonal message on 137.777 using the arduino/ad9850/decca. Raspi1b on the blink. Nov. 3rd Copied G3XDV on 136.172 kHz. 13-14 Nov. OP32 500 watts 4 amps to the big RL. 137.477 kHz. Lovely strong sigs appearing on the DF6NM grabber as of 2238. 14-15Nov. SV8RV reported that there had been several OPDS decodes since the 13th and many times by EA3HNK. 09-12 Oct. 2 modules 3 amperes to the big RL (100m at mean h=20m) Good reports from western EU with traces from the East. Thanks all! 2E0ILY DF2JP DF6NM EW6BN F1AFJ H. Wolff RN3AGC RN3AUS and SQ2BXI 13 Oct. Reports from WA3TTS F6CNI F1AFJ RN3AGC and 2E0ILY. 13-14th: A sudden drop in signal levels. The Kyoto dst plunged 131 points and CFH could not be seen on the DF6NM grabber at times. CFH has been active for several weeks after a long hiatus. 19-20 Oct. Seems CFH is now QRT again. Tried OP32 on a raspi after the ardino went on the blink. A nice report from Joe DJ2JP for whom this was his first TA OP reception. He noted the strengh was exceptional. 2016-10-20 04:33:36 VO1NA 4189km 137477.004Hz 1mHz -40.7dBOp 100% 18.2dB This is surprising as the small RL was switched in with only 1 Decca PA after the big RL developed a huge SWR around 0030 utc. 22 Sep. CW on 136.5 kHz 500 watts 4 amps to the 2 RL's. A spectrogram was received by PA0RDT but Roleof reported the sigs were too weak for an aural reception. The TX is on again. 09 Sep. Comparison of 12x100 and 20x100 RL. The latter being about 12 dB better at a range of 60 km. 14-19 Sep. Reports from DF6NM (along with strong spectrogram of CFH) EW6BN DJ7FC and DF2JP. Also a clear capture from SQ2BXI. 2-3 Aug. OP32 150 watts 2.2 amps to the 12x100m RL. DK7FC reported good freq accuracy (137.477000 kHz). Also seen on DF6NM OPDS. 4-8 Aug. OP32 off for 9th due to lightning. 10th 500 watts 4 amps. to the 12m high 100m long RL. Reports for the past week: G3XDV DF6NM and IZ7SZL (10th). TNX to R7NT for forwarding reception info of F6CNI PA0OCD. PSKREPORTER:PA7EY, G3XDV LA3EQ. 11th. F6CNI good reception. 11-12 Aug. New aerial: higher 100m rotated "L". 500 watts 3.8 amps 1.48 mH tuning inductace. QRT for abt 1 hr due to lightning ~0300. 14th reports from IZ7SZL and M0OSZ despite the mismatch and using only 1 Decca module 2300 utc. pskreporter: PA7EY G3XDV F6CNI G6AVK M0DSZ. 2300 Starting OP32 again. RL properly tuned, 2 Decca modules, 500 watts 3.5 amps. 15th. Reports: R7NT(QSP reports) f5wk df6nm(qsp report from yo/4x1rf, sv8rv) ik0vve, m0dsz and pskreporter: PA7EY	F6CNI	GW4NOS	PA3ABK	G0LUJ	SP5XSB	IK0VVE	LA3EQ SM2DJK. Tonight: EbNaut 0.2s 4K19A 771.2s message starting 2330 and every 15 mins. 500 watts 3.6 amps RF. 17th. IZ7SLZ decoded the 155 character message received at DK7FC. 18th-20th. EbNaut 137.477000 kHz. 18 DF6NM copies the 54 character message twice but only 0 and 2.4 dB Eb/N0. Better reception on the 20th by NM & FC. 27-29 Aug. cw beacon swtiching between low and high 100m RL aerials. DF2JP grabs show high RL slightly better. Whitbourne 60km bearing 240 degrees has high RL at 10-12 dB better. (using 1' 30t loop + Burhans preamp). Very weak or nil with miniwhip + FT817 which is deaf on 2200m without a preamp. 18-23 July. 500 W 3.7 A QRSS100. 2330-0930utc. Reports from PA0RDT(heavy QRN) , DF6NM(quite readable) , DF2JP(strong) and DK7FC(good) and K3SIW(vy weak). 22 Good copy G3XDV. Best just before dawn in lower eastbourne QRM. 23. Reports from Andy (measured QRG as 137,777.009+-0.01Hz and Max IK0VVE. Off tonight due to risk of lightning. past week:one decca module to the 100, wire at 12m. raised big rl but tuning trouble so brought helix to shack for checkup 27 Mar. 20 March. 1 module of decca. high swr at tx end but good at RL feedpoint (??) Strong signals reported by DF2JP (traces of XIL too). Seen on DF6NM DK7FC G4WGT grabbers. 21 March. On again. Still high SWR but only at shack end??!!. 23 Mar very high SWR to the RL. Later noticed it was on the ground again but not before sigs were detected on the DF2JP grab. Switched over to the low wire. Good clear spectrograms at DF6NM for the QRSS50 sigs again tonight. 06 Jan 2016 Resume carrier at 0900-1200 UTC for andipodes detection attempt with Edgar. A QRSS100 ID was received by F1AFJ late on the 5th. 06-07. Strong reception of the dot100 at F1AFJ. 0900-1200 carrier 3 decca modules, 100m RL in attempt to send 2200m photons to Edgar in VK7 on the 6,7,8th. 9-10th. Strong captures at F1AFJ and G4WGT. No sigs seen on Edgar's VK7 captures. Nice captures at DK7FC and DF2JP along with fuzzies (due to DCF39 and not the ATU frame arcing and ablaze) 25-28 QRSS100 for ~48 hrs. Reports from DF2JP and F1AFJ. Traces seen on the DF6NM grabber for almost the whole period including daytime. 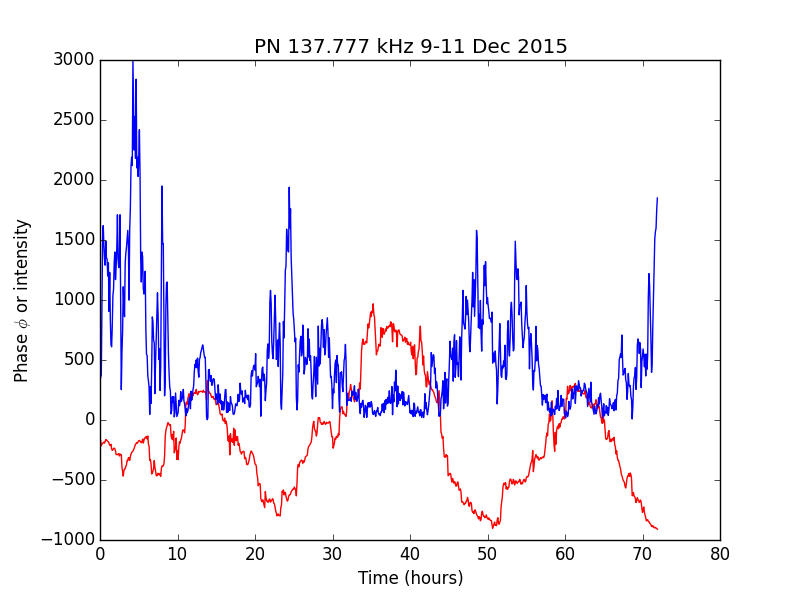 Paul and Markus' phase/magnitude data of dec 2015. December. Various tests with EbNaut. 5th 131 characters sent in less than 11 minutes. Received by PN and DF6NM on 4th-5th. 5 second symbols starting morning of 5th. Received by PN during day. Pauls plot. Offset = -255 uHz. November 01: RN3AGC veak trace. 04 QRS100 5A RF good strong copy at DF2JP. 05,06 OP32. Reports of good decodes at DF2JP, IZ7SLZ and SV8RV. Pskreporter log: G3XKR DF2JP EI8JK G3XDV 2E0ILY. Thanks to all. 07. Reports of OP32: DF2JP G3XDV IZ7SLZ SV8RV TF3HZ G3XKR PA7EY SP5XSB SV8RV DK7FC. Also DF6NM who confirmed the carrier phase was adequate for EbNaut experiments. 08 QRSS100 137.777 kHz 09: OP32 137.477 kHz. 09: OP32 Reports from G3XDV DF2JP IZ7SLZ and the usual insightful commentary from G3NYK explaining the good prop. in light of the -80nT DST and the poor reception at TH3HZ. 2 hops, but sometimes 1 and 3 as well... OP32 again tonight. DF6NM analyses the signal. A 0.7 mHz error and temporal fluctuations of 0.5 mHz. The TX was off for a while before 0304 utc to prevent interference to a scope. Markus observed a 0.1 mHz error in LORAN sidebands near 137 kHz which was likely due to Doppler from ionosphere motion. Thanks to Chris 2E0ILY Iban EB3FRN Ulrich PA3EY and Graham for reports and email and about a dozen spots on pskreporter for the transmisions on 10-11th. 11-12: OP32 5.4 amps to the 100m wire. DOXCO was adjusted today (first time in 2 years) and there was some tower work -- top guy saddled and a new halyard. 11-12th. 5.2 amps op32. Frequency correction apparent on DK7FC IZ7SLZ and DF6NM sites. 18th. DOXCO restored to orginal calibration (5.29 volts on VCO). A rounding error (TNX DF6NM) causing the OPDS freq to be low by 0.7 mHz. was corrected. Phase shift experiment and QRSS transmissions. 21st. Finally sent a phase shift across the pond! Much jubillation and cat excitement. The event was heralded by evidence from Markus (Germany) and Paul Nicholson (UK). Paul's spectrum. Earlier today the more recent 100m wire was raised again. 22nd November. First attempt at EbNaut (137.777000 kHz 8K19A 13 chars 896 symbols 2s duration 29:52 total sequence time) resulted in transatlantic disappoint, a disgusted cat and profanity. Software engineering glitch? 24th November. 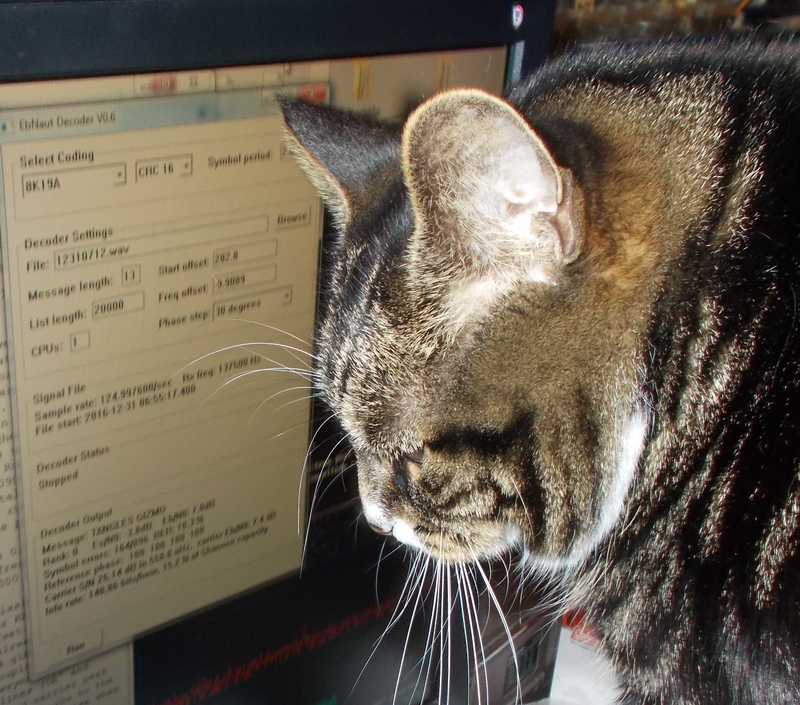 The cat's name crosses the pond as confirmed by DF6NM P. Nicholson and IZ7SLZ. 25th EnNaut received by P. Nicholson and IZ7SLZ. 26th. PN, DF6NM and G4JNT. 27th. TX on 2000 using CHU for timing again. 29,28,30. ebnaut including day transmission. Night decodes by P.N. and DF6NM. No daytime copies though Paul could see the carrier. 30th -31. DF2JP strong, and RN3AGC traces of sigs. 29th. G3XDV G4WGT and RN3ACG kindly provide traces and reports. 26-27th. Mucking about with the VLF/LF/MF exciter followed by a test run to ensure it still works on 2200. 5 amps 100m wire. Fuzzies at first (seen on DF6NM G4WGT and DK7FC grabs). Then removed exciter xfmr and put big xfmr (tnx G3LDO) before tuning coil. Seems to have reduced fuzzy sigs. Report of strong (audible 0100) at DF2JP. Traces reported by Alex RN6AUS in Moscow. 20-21st OP32 5 amps RF till 0157 then 2.2 amps. 6dB drops were seen on the DK7FC and DF6NM OPDS reports as well as 1 mHz freq. accuracy. 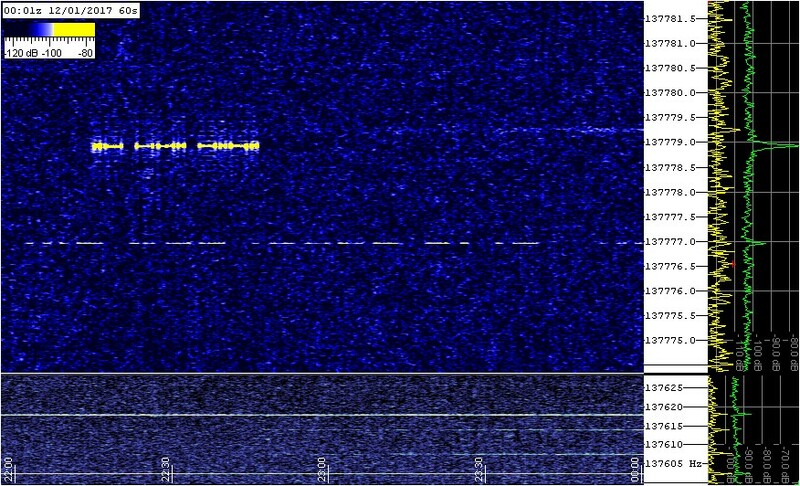 SV8RV copied OPDS 2 frames (QRA 5905km). G0NBD provided compliments on the signal strength as well as updates on the PSKreporter. Thanks to all for the grabs/reports/ encouragement! OP32 reports from LA3EQ PA3ABK DF1VB PA7EY G4WGT DF2JP and G0NBD relayed by Graham. 19th Another strong cap by PA0RDT with traces 1.5 hours past dawn. PA0RDT capture 0656-0816 2 hours after his local sunrise at 0609. DF6NM high res spectrum showing sidebands, phase coherence, freqency accuracy and possible post dawn peak. 17th. Audible sigs at PA0RDT, despite (recent) poor conditions following a dip in DST. 11-12 Oct. 3 Decca modules engaged and no fuzzies or incoherent phase seen on the DF6NM high res grabber. Nice caps seen on G4WGT Dk7FC grabbers. Joe DF2JP sent a nice capture without fuzzies. The syth, u-processor and keyer/divider/driver were partially dismantled and reassembled with more shielding in an attempt correct the phase/freq instabilities. It seems there may have been some ingress of carrier to the synth. 7-9 oct. 200 and 500 watts. Fuzzies only at higher power. 28,29 Sep. Reports from G3YXM (bit of wobble on frequency) and DF6NM or phase incoherence. 23-24 Sep. 3.5 A RF to the 100m wire at 10m. QRSS100. 4-7 June 3A RF QRSS100 100m wire. Report from DF2JP 4,5th. 09 June 2015. QRSS100 again. Seen on DK7FC, DF6NM & G4WGT grabbers. 9th May. DF6NM notices the op32 carrier is unstable. Aerial problems again or is the exciter misbehaving? 6-8 May. 3-4 A RF to 100m wire. QRSS100. Report from Joe DF2JP on 7th. 20 April 2015. Rebuilt Decca power supply. High SWR on the first day but reduced L for better tuning on the 21st. Reports on 20, 21 from DF2JP with good signals. 3 to 4 amps to the aerial 22,23 and 24th. 29 OP32 3 amps RF. df2jp joe, eb3frn iban , g3xdv mike, g3xkr sp5xsb. 31st. Testing CW on 136.500000 kHz. ~10 watts to 100m wire. Not heard at 60km with miniwhip. March 01 3 Decca mods. 3 apms RF QRSS100 on at 2047. (still daylight) Shortly after TX on air, DF2JP reports improved sigs and on the morning reports" the most outstanding signal I�ve ever seen from your side." The sigs were audible. Good reports from F1AFJ (>20 dB over noise) GW0EZY (fuzzy sigs) although not sure why they were fuzzy G4WGT too(sigs nice & clean). Lovely sidebands were seen on DF6NM's high resolution spectrum. Henny's PA3CPM capture shows sidebands and fuzz!!?? 2nd: More reports of fuzzy signals from PA3CPM, G4WGT, GWEZY and DF6NM. A trip up the hill on snowshoes in the dark and cold last night (3rd) revealed the cause of the problem. Wind had blown downlead against the wood ATU frame causing part of the latter to go up in smoke. DF6NM reported stable signals again last nigt. 4 Mar. Reports: PA3CPM DF2JP YV7MAE DD7PC F1AFJ. No fuzzies this time. A greyline fadeout was observed by DF2JP followed by a brief return to 1041 UTC. 5-6 Mar. Reports from PA3CPM DF2JP and PA0RTD with whom the sigs were audible. TX off 1112 6th. Another greyline fade/return at 2JP. TX on 2111 6th. 7th: reports from PA0RDT, PA3CPM and another daytime reception up to 1200 by DF2JP. The TX was switched on again today at 1306. 3.8 A RF QRSS100 to the 100m RL. Daytime copy at DF2JP, W1VD and W1DEX. 8th. PA3CPM PA0RDT(audible) EW6BN. DF2JP daytime capture. Local noon. 9th another copy by DF2JP and audible in 500Hz B/W at PA0RDT with a mw antenna in the hawthorn tree. 14-15th. A test carrier from 2326-0141 followed by QRSS100. Reports from RN6AUS,PA3CPM, DF2JP and G4WGT. Good copy on EW6BN grabber. 19-20 Mar. Eclipse experiment foiled by mother nature: snow, iced and detuned aerials and to top it off, poor conditions! Reports from PA0RDT , DF6NM (no trace of sigs) and PA3CPM (a weak trace). 23 Feb. QRSS100, 2 amps from 1 Decca mod. 24: 4 Amps RF from 2 mods. Reports from F1AFJ, G3YXM, DF2JP. 25: High SWR. 2 A RF. 26th. Good copy at VE2IQ despite poor signals to the west from the 100m wire. Good copy by Joe DF2JP. Also seen clearly on the F1AFJ G4WGT DF6NM and DK7FC grabbers. 28th. 1 Decca mod to the 100m wire.QRSS100. Report from Joe DJ2JP of weaker sigs. 01 Jan. 4.5 amps to the 100m wire. 137.777000 kHz. CW 12 WPM. We start the new off with a new milestone in amateur LF TA tinkering. 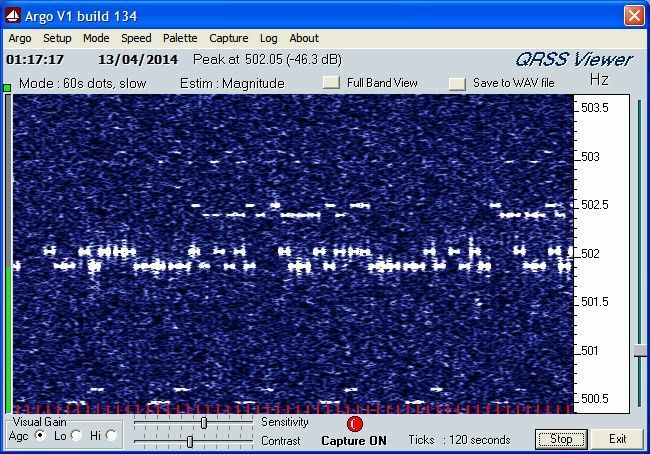 Hartmut copied the 12 WPM in QRSS3 mode, a record speed for transatlantic LF for this station. F1AFJ reported strong sigs and mentioned QRSS3 QSO is possible. Also VE3EAR (nice to hear that sigs going west. This had been a problem with the original 100m aerial) F1AFJ SP5XSB EW6BN RA3ACG DF2JP VE2IQ DD7PC F1AFJ (25 dB above noise) F6CNI( 40dB, audible) OK2BVG RN3AGC and RN6AUS on the 14th. 15 Jan.3.5 amps to new 100m wire. 16 New aerial detached mid-callsign at 0000 utc 17th Jan. Noticed missing signal on DF5NM grabber. Put on the original 100m wire and ran 200 watts, 2A. Reports from G4WGT F6HCC F1AGJ F6HCC and H. Wolff. Took up some slack on the old wire halyard to prevent pulley chafing through the halyard. There is still a problem with the 1.6 mH helix so tuned new wire to 477.7. Off air on 2200m 17 Jan.
December 24-28. 200 watts and then 500 watts 3.5 amps to the 100m wire. Christmas message was copied by DF6NM F6CNI EW6BN and F1AFJ. Also seen on the G4WGT grabber. On the 27th F6CNI reported 30 dB S/N with audible signals. 29-31. Reports from F1AFJ F6CNI and H. Wolff. 1st. 5 Amps to 100m wire. dot 100. Received at 'audible' levels at F6CNI, 25 dB above noise. Good copy at DK7FC. 2nd. DF2JP reported good sigs and fadeout an hour after his local sunrise. 3rd. TX on 1938-0832. 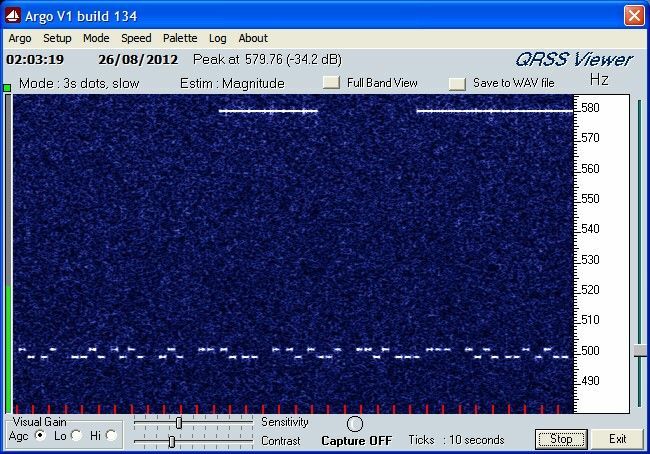 F1AFJ restarted his grabber abd reported sigs 'are visible all the night' from 20:30 to 07:30 at 10-20dB over the noise. 3th. TX on 1948. Received at F1AFJ 20:10 to 06:50. 20 Oct. OP32 5 A RF. Reports from IZ7SLZ and SV8RV. DF6NM and G0NBD advise via the RSGB reflector that the 2200 OP band mas moved down. A new QRG between 137.455 and 137.545 is needed. Hope to replace 4020 with faster 74LS161 for 630m operation with docxo. OP on 630 also moved 478.50+-.05 kHz 21st. 22nd. New frequency for OP32: 137.477 kHz. Reports: G0EZY; seen on DF6NM and TH3HZ grabbers. 23 Oct new exciter on line with 4011 keying stage. 180 watts/2.2A RF on 137.477 OP32. Reports: G0NBD (relay) G3XDV, GW0EZY G0KTN. Monitored on TF3HZ, DF6NM and DK7FC OPDS. Last 2 gave QRG as 137.476999 kHz. 28-29 Oct. 4 amps to 100m wire. Reports OPDS and PSK Reporter: LA4ANA LA3EQ SM6BHZ DL-DWL F6CNI GW0EZY G4WGT G4MDH G3YXM G0KTN G3XDV SV8RV G8HUH EW6BN DF6NM (UNTIL 0733UT) TF3HZ W1VD W1TAG/1 30th. G8HUH and F6CNI, who reported audible signals. 30th Good reception at EW6BN. 1st. 5 Amps from the Decca with 3 PA's engaged. 100m wire at 15 m high. F1AFJ: "monsterous signals" maybe saturating his agc. OK2BVG and PA3CPM report very strong signals. EW6BN reported good sigs too. F1AFJ sends an MP3 of the audio. Incredible to actually hear the signal! 2nd. Weaker sigs copied by F1AFJ and PA3CPM. and a report of less clear sigs was received from VE2IQ, 1800 km over land to the west. 31. Good copies at PA3CPM and F1AFJ. An apparent frequency shift of 0.01 Hz was noted on the DF6NM hi res grabber. Markus explained that a computer issue caused the LORAN frequency lock to be lost and the free running xtal drifted down as it cooled. A record breaking July in terms of temperature has not resulted in excessive heating of the TX system except for the LV (25V 1A) xfmr which was too hot to hold. Despite the high A,K indices (25,3), UW8SM, DK7FC, DF6NM and R7NT were copied last night. For RX, the 100m wire (usual TX aerial) was used. It has 2 mH of series inductance. The RX was the FT-817 without the external (35dB) preamp. IPO was engaged (to remove the internal preamp) and the AGG was off. 15 Apr. DF2JP DF6NM and DK7FC copied. 17-19 Apr. 70 w to 100m wire. DF6NM F1AFJ and F6HCC reported reception of the QRSS100 sigs. 20th. F1AFJ reports sigs along with those from XGJ , XES and XEB. The wire is covered with ice and the current is very 19th. F6HCC also reports sigs despite low aerial current due to icing. 23rd Reports from: PA3CPM F6HCC IZ7SLZ & F1AFJ (strong sigs) 29th PA3CPM F1AFJ KL1L (nil) 30th PA3CPM F6HCC (online DF6NM nice sidebands) and F1AFJ. March 01,2 OP32. 3rd. QRSS100 50 watts, 1 amp to wire. 03 Gary G4WGT reports good reception. 04: 30 watts 1 amp. T=-10 C. traces seen in hi res spectra of DF6NM. 01 February. 4 watts output. Lovely clear copy at Hartmut's, Trace reported by PA3CPM. Poor copy on 4th but much improved on the 5th at PA3CPM. F1AFJ grabber showing good sigs. 7th G3XDV copies OP32 sigs. 9th G3XDV reports "Consistent signals from VO1NA (3742km) on 137kHz Opera32 last night. Nothing seen on the Opera software, but OPDS produced decodes at 0308, 0343, 0418, 0453 and 0603UTC, all around -40 to -43dB S/N." 11th. OPDS at DF6NM following power increase from 4 to 6 watts. Also TF3HZ. PA3CPM and DF6NM report copy and traces. 15 Feb. 16th. Wire is lowered in anticipation of sleet and wind storm. TX off. 18th. G3XDV requests stations to send some OP32 so raised wire but it is fouled by 2 trees. Despite the reduced height and loss of RF to the trees, W1TAG and W1VD report reception of OP32. 19th: increased power to 40 watts; 20 reflected. Copy seen at TF3HZ and very weak traces on spectrum at DF6NM. 20th. A weak trace and decode at DF6NM. 21: increased power a bit. 22: reports from G3XDV (opds reception only) and G0EZY. Up in the woods on snowshoes with axe. 3 trees down, 1 wire up. ~25 watts as of 2019 but high SWR in freezing drizzle. DF6NM reports a single OPDS decode. 23rd. Antenna now ice-free; current 1 amp with 50 watts. 24th Multiple decodes reported by G4WGT, DF6NM, and G3XDV. 25th GW0EZY reported 5 decodes using OPDS, 1 with Opera. 26: 6 decodes GW0EZY. 27 9 decodes by GW0EZY, 3 DF6NM and 2 G3XDV. 1 January: 400 watts to 100m wire. Henny PA3CPM Gary G4WGT. 3rd Reception XEB on 137.777, DF6NM and DK7FC on 135.172. DF2JP on op32. 3 Jan CW 450 watts 3.5 amps. Mains power rationing. 4,5: QRT as DOT power supply is wired for 234V. The 55 and 12.6 V 117V xfmrs are replaced by a sigle 1.5 kVA (Muskrat Falls) xfmr. Now not so bad blinking house lights! 6th 2000 utc: all seems well since 1900 UTC when CW started with 4.4 RF amps. Sigs can be seen on Hartmut's and Markus' grabbers. 7 CW again with only 3.5 amps out; today's warm wx changes Z of wire. 8th: QRSS100 9th: Rectifier fried at ~0645 UTC. Reports of "good signals" from PA3CPM Henny and Gary G4WGT, and relays from Alex, R7NT. 9th: It's back to the old 2003 system: low power, inaccurate frequency and phase incoherence. QRSS100 65 watts to the 100m wire. 12,13 Jan. QRP 5 watts 0.4 A. Traces seen at 438uHz at DF6NM. Copy at H. Wolff and TF3HZ grabbers. Perhaps the 1st QRP TA on 2200m from here? Using Decca with 12 volts 1 amp on its HV terminal, DOXCO referenced AD9851 divided by 16 and phase coherent keying. Hartmut's copy on the 14th. Also reported by PA3CPM. 14-24th. Tried lower power while awaiting a new rectifier. Good copy at 5 watts and traces at 1 watt on Hartmuts grabber. Traces seen on the high res. grabber at DF6NM. Grabs seen at F1AFJ and TF3HZ. 26th. Increased B+ on Decca to 16 V. getting 37 watts and just under 1 amp of RF to the 100m wire. Also took in a bit of slack in the far halyard to ensure it wasn't getting frayed (save a trip up tower) and raised the mean height a bit. Good readable signals were relayed back by Henny PA3CPM. Also seen on H. Wolff, F1AFJ and TF3HZ grabbers. 28: Report from PA3CPM. Caps at F1AFJ, TF3HZ, H.Wolff, DF6NM, G4WGT. Power reduced to 10 watts today. 30. Excellent cap by PA3CPM. 31. Output reduced to 5 watts. December. 1st: OP32 400 watts to 100m wire. 3-5th. Reports from Alex R7NT Graham G0NBD. OP grabbers: DF6NM TF3HZ F4DTL G0KTN G8HUH PA0A F5WK RN3AUS. 24th: The 2003 exciter was called back into service for a Christmas mesage. The phase incoherence, frequency and spelling errors were clearly seen on the DF6NM grabber. Reports also from DK7FC and G4WGT. 25th. Back to the 2013 exciter. 3.5 amps to 100m wire from the Decca. 26-28. Running dot 100 and looking at sidebands on Markus'narrow grab. Reports from G4WGT, F4DTK RN3AUS (weak traces nr Moscow). Tom SM2DJK 28. H. Wolff. reports sigs at 2009 utc. 29 from R7NT Alex. VO1NA 137777 GN37or QRSS100; DM4TR JO61de 4569; DF6NM JN59nk 4566; DL-SWL JO52ho 4406 DK7FC JN49IK 4404; YV7MAE FK81bd 4202; F4DTL JN18fp 4010 Report of fat signal from DF6NM. F4DTL Nicolas and H. Wolff send report/capture. 30 Dec Alex R7NT reports receptions by DM4TR, DF6NM, DL-SWL, and other TX stns, QRSS and other modes. 31 Dec F4DTL Nicolas captures WE2XEB NY, WD2XKO NC, WD2XGJ MA, WD2XNS CT USA and VO1NA NL CAN PA3CPM sends report. November 19,20. QRSS30 to 100m wire. Report of weak sigs on 137.777000 kHz by DF6NM on the 20th. 26-28th. OPERA32 135.555000 kHz. 29-30 OP32 again. Many reports including G0NBD DK7FC R7NT. October: Reception experiments on 74.5 kHz using retrofitted XH100 RX. Much drift -- to be corrected. Bob WG2XRS/4 in New York. Stability better, sensitivity worse. 22 Oct 2013. That's much better... Now see if the TX still works. 24th. OP32 starting around 0040 utc. 450 watts to the 100m wire. Reports received from DF6NM, W1VD, DF2JP HF3HZ. 18th: OP32 137.555 kHz : 10 ID sequences copied by DF6NM. 19-20th. Only one reception at DF6NM who identified and fixed a rx problem and received a dozen ID's the following night. Thanks also to Graham for his report and Spiros SV8CS who received the sigs across 4889 km as determined by DK7FC. Reception also at TF3HZ, W1TAG and W1VD. 21: Many receptions at DF6NM. Off air for next week. 27-31 OP32. Many reports: TF3HZ W1VD DF6NM YV7MAE GW0EZY SV8CS. 28 Oct 2200utc start experimenting with antennas. June: Trying a new signal source and phase coherence. DF6NM gives a positive report, but identifies areas for improvement wrt phase glitches and freq chirps. Accuracy not too bad: 137.77702 to 137.77704 kHz. Another daytime copy at VE1VDM at 840 km away. Traces starting to appear on F1AFJ grabber at 2330 utc. 3 June. TX still on. Report from Michel F5WK of chirp which is readily apparent against the loran line. Reception on F1AFJ grabber 2300-0450 utc. F1AFJ reception between 2320 (3rd) and 0420(4th). 4th. Checking for thermostat transients in the freq of the docxo o/p. Put a 6dB bjt amp between the docxo and dds. 5th: reports from G4WGT and DK7FC who received the sigs between 0050 and 0300 utc. Markus in a critical report said the sigs looked better and the QRG was "137777.0028, give or take a couple of 100 uHz." It also seems the chirp and phase glitch problems have been resolved. Thanks to all! TX on again tonight 2330. 6th. Andy F6CNI checked the stability and found better than 0.005 Hz over 2 hours. Jay V1VD switched the RX ant to get a strong copy as well. 7 June: Plans are made following discussion on the Blacksheep news group to try 137.555 kHz for Op32 experiments. 18 June. DF6NM measures frequency as 137.7770000 kHz. DOXCO and synth seem to be working well together. 22 June OP32 transmissions commence 0000 on 137.555 kHz. Receptions have been recorded at G3XDV G4WGT G3XDV GW0EZY PA0OCD DF6NM DF5JP and W1TAG. It seems the summer equinox TA path is open from 0000-0500 utc. Markus sends an informative spectrogram. The sigs are phase coherent, accurate and stable, and agile as we are no longer rock-bound to 137.777 kHz as for the past decade. Particulars of the new station were sent to the Blacksheep RSGB reflector. 23 June. Reports of OP32 reception from DF2JP (using 1m rx loop) and DF6NM. 24 June. TX power reduced from 450 to 150 watts. Reports from Joe and Markus. 22-28: DF6NM detects sigs each night. 28: G3XDV copies. 29: DF2JP copies the Op32 but not G3XDV. 30 June Copy reported by DF2JP. May. 24th on 1855 450W TX to see if it is reaching Vern during the daytime. 1831. Yes, indeed! Reports from Markus and Jay. 19th Replaced fried rectifier in 60V 20A supply. Now running 450 watts to 100m wire. NA DFCW. Captures seen on DF6NM, TF3HZ, VE1VDM, G4WGT and W1VD grabbers 23rd. Workbench... still trying to improve coherence,stability, accuracy and agility of the long wave signals at this station. Apr. 70 watts to the 100m aerial. Seen on the grabbers of F1AFJ, G4WGT and on the 9th and 10th, clearly on the DF6NM grabber, suggesting very good conditions. Mar. Running about 50 watts. Reports from H. Wolff on 4 and 9th. 11th: HW captures sigs again along with XES, XGJ, XKO and XNS. 01 January 2013. Adjusted carrier freq. up a bit to just above 137.777 kHz because it had drifted down about 0.1-0.2 Hz since being last calibrated against the 5930 Loran sidebands. 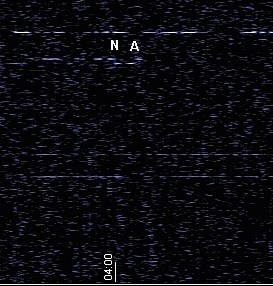 Transmitted new years greetings using QRSS60. 450 watts 3.5 amps to a 100m wire at about 15 m height. Reception report from Ed R7NT and captured by F1AFJ, DF6NM, YV7MAE grabbers. Also seen were XEB XES XKO XNS MP FNY DF7KC DF6NM AGC. December: 100 watts from new TX/driver. Strong sigs received by H. Wolf on the 9th. At 1944 the Decca was finally restored to operation with 2 PA's and 500 watts, 3 amps to the 100m wire. Nicolas F4DTL reported very strong signals while Marco, IK1HSS saw some sigs even with the Alps in the way. 12 Dec Report from Victor PA3FNY. Strong sigs. Possible trace from UW8SM. 13: G3XDV: 0230 to 0940UTC: more than 1.5 hours after UK sunrise. H. Wolff:2030-0930 peaking 0600-0630 13-16: receptions by H Wolff and after sunrise captures by Victor PA3FNY (0900 utc) 17th Tried with Stefan to get WSPR to start. 18. Start monitoring OP23 136.00 USB but nil. Hint from W1JT on starting WSPR. 20: Received WSPR sigs from DK7FC on 137.46 kHz -- the first WSPR reception here. 22-28 Dec. Reports from W1VD(22) Hartmut (25) nad Terry GW0EZY. An unusual daylight opening to Iceland took place on the 27th which was seen on the TF3HZ grabber. (1200-1500 UTC). 30th. Good reception at YV7MAE along with WD2XKO WD2XNS VE3OT (MP) DK7FC and DF6NM. November: 10: 100 watts 137.777 kHz to 100m wire using new IRFP260 and 4427 driver. Heat sink was cool this morning. Checked the DF6NM DK7FC TF3HZ and G4WGT grabbers and found traces on WGT. 11 Nov: Opera32. Thanks to G0NBD and G4WGT: 11/11/2012 23:23 136 VO1NA de G4WGT Op32 2185 mi -40 dB in Chorley, IO83qo 12/11/2012 01:45 136 VO1NA de G4WGT Op32 3517 km -37 dB 03:19 136 VO1NA de G4WGT Op32 3517 km -35 dB 03:52 136 VO1NA de G4WGT Op32 3517 km -33 dB 06:04 136 VO1NA de G4WGT Op32 3517 km -39 dB 14th DFCW 100 watts 1.6 amps. Very strong on VE1VDM grabber, but very weak at G4WGT. 24 The beacon has been running for several days. IRFP260N & TC4427 driver are working well. Reports from DF6NM G4WGT and VA7JX. 30 October: OP32 receptions : 2113 PA0A -38 dB and 2202 DF6NM -36 dB. September 01: OPERA32 starting 2200 UTC. 137.777 kHz 4.5 Amps Reports from GW0EZY(-28dB), F1DTL(-40), W1TAG(-40), G4WGT(-25) and DF6NM(grabber). 03-05 OP32. VE1VDM(-26) and DK7FC(-40) Reports received so far: GW0EZY F5WK DF2JP F4DTL G4WGT G8HUH VE1VDM and W1TAG. 6th: DFCW copied by GW0EZY. 11th: Reports of good reception fron DK7FC and W1VD(25 dB s/n in 28 mHz) and GW0EZY who noticed the post dawn enhancement. Alan, G3NYK offers a masterful explanation: " I think you will find that the shadow is around 1/4 of the way into the path. This suggests to me that the 2nd ionospheric hop point of the signal has been washed out by the solar radiation. The remaining signal maybe a weak one-hop (!) or possibly one night hop followed by two daytime D-layer hops. I think this is unlikely, but dont role it out, but D-layer daytime skywave is usually weak in the early morning. " 31 Aug-1 Sep: DFCW 4.5 amps. Reports from Terry GW0EZY and Martin YV7MAE. 29-30 Aug. Initial try with ARGO 8 and 32. Then DFCW. 26 August 1200 Watts input, 5 amps aerial current to the 100m wire. Another QSO with Stefan, DK7FC. Stefan's signals were audible for the second exchange. The rectifier in the power supply for the Decca amp failed while the final K was being sent from VO1NA. Also heard were signals from WD2XGJ. July and August. 10 watts on 184.5093 kHz comparing 100m wire and tower. Reception at Comfort Cove 1940 UTC 21 August: video. 22 QRSS75 Seen on G4WGT, D46NM grabbers. 4-5th: 1.2kW QRSS75. 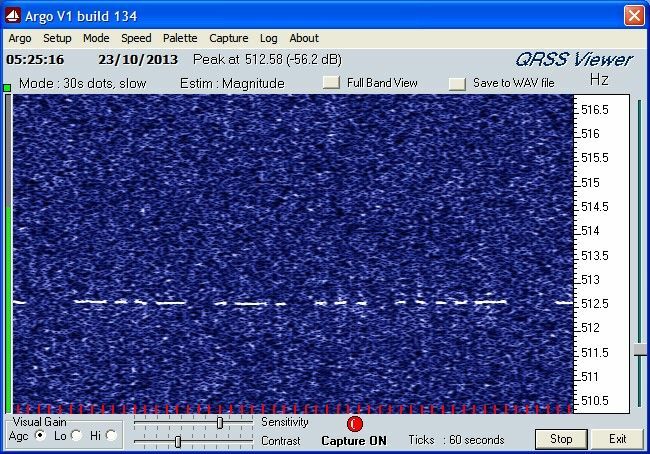 7: VE3EAR Sigs blasting in (on QRSS3!) but not audible. DK7FC 20dB S/N at 22 mHz (2330 utc). 4X1RF 20 dB S/N before sunrise. G5WGT good overnight copy. 7th: Good copy at PA3FNY, Excellent at F5WK, along with WD2XES on 137.779 and WD2XKO on 137.7777. Bruce VE3EAR reported nice sigs. Big sigs reported again at G4WGT. See Michel's and Gary's copies below. 8th: Strong copy at G3XDV including initial 2 hours of key-down! February: 5 Amps RF 1.2 kW DC. 25: EC4AA. 29: CFH QRT on 137 kHz. December: 1200 Watts 4.5 Amps RF to a 100m wire up 15 metres. 1st: M0BMU reported another daytime reception. Propagation expert G3NYK writes in response to Jim : "a low level geomagnetic event pushed the Dst index down a bit on the 30th and the 1st. At this time of year this could give a significant increase in the daytime ionisation in the D-region. I have seen very noticeable effects on shorter daytime paths immediately after a major geomagnetic event, and I have seen some variations that seemed in time with Dst values on the path to Lakihegy HGA22. My other thought is that the daytime D-layer could be weaker at this time of year and not absorbing so strongly so the signals could reach the E-region. However it seems unlikely that the returning signal would be strong enough to detect." Thank Alan. The TX was shut off at 1101 UTC which was the time of last reception at M0BMU. 4th: Reports from F1AFJ (a big pile up in the TA watering hole: WD2XES, WD2XNS, WD2XGJ, WD2XKO, VO1NA) and PA3CPM. 6th: a brief transmission between ~2100 and 2400 was copied by DK7KC, G3WCB and RW3AGC. Signals were then received from DK7FC and PA3CPM using the FT817, tower and National LF10 preselector. 8 December: 2320 UTC Aural reception of DK7FC at 4400 km. Audio: clip 1 and clip 2 at 2358 UTC. This is the first TA aural reception of an amateur LF signal at this station. Coincidence: first aural reception of this station was in Germany (H. Wolff). DFCW transmissions (4.5 amps 1200W) on 137.777 were received by PA3CPM,PA3FNY and DL7ET. 10: RN3AGC and G3WCB reported. 11-14 Dec. Called CW DFCW10 and with considerable incompetence ran DFCW60 before reducing the FSK. Ran CW for local reception experiments. Reports gratefully acknowledged from RN3AGC G3WCB and VO1SQ. 14: Reports from RN3ACG PA3FN and VA7JX. The reception by VA7JX is the first transcontinental LF transmission from this station. Jacks reception on 137.777 kHz about 0400 utc on 13 December. WD2XKO is also visible at 137.7777 kHz. 27: Another TA QSO with DK7FC. Stefan was using QRSS3 to yield O copy and audible signals. Below is a partial transcript of Stefan's signals. Receiver: FT-817/LF-10 preselector and 100m wire resonated with 1.6 mH. 30: Stefan had some TX trouble but a tone was heard on 136.17 kHz: a glance of the ARGO screen showed it to be Jim M0MBU. This is the first audible 2200m reception from the UK. Following the ensuing festivities, the VE3OT Beacon MP was seen on 137.78 kHz. . 30: Audible signals heard from M0BMU, the second station to be heard from across the pond. Also, 6 complete frames of OPERA(a digital mode) were received on 137.38 kHz from G4WGT with thanks also to G0NBD. 31: TA signals received from PA3CPM PA3FNY PA0A DK7FC DK6NM M0BMU and G3KEV: ARGO Screen around 136.17 kHz. November 1 1kw 4.5 amps. Reports: PA3FNY PA3CPM F1AFJ. 2 Copied WE2XEB on 184.51 kHz. FT817/Burhans preamp(35dB) and tower. 20 Nov. TX on again. 4.5 Amps to 100m wire at 15m. Reports from PA3CPM, RN3AFC F1AFJ and DF6NM 21: PA3CPMi, F1AFJ, RN3AGC and F-60130 reported strong sigs. 22: Strong sigs received by M0BMU using a 30 cm ferrite rod antenna. 25: Copied by PA3CPM and an interesting reception by M0BMU at 1120 UTC over a full daylight path. The abrupt disappearance of the sigs corresponds to the TX being switched off at 1121 utc, a half hour after local sunrise. Local sunrise time 1051 UTC, at M0BMU 0740 UTC. 26: Reports from MOBMU PA3CPM PA3FNY and 4X1RF. 27: Reports from DF6NM 4X1RF PA3FNY F1AFJ and G3WCB. 28, 29 PA3FNY 30 PA3CPM. 30 Another daytime reception by M0BMU. but once this was removed, reports were received from 4X1RF F1AFJ F4DTL and PA3CPM. The fried relay has become a celebrity: please see page 58 of the December 2011 RadCom. It is also a testament to the brute force of a Decca amp! 23 Oct. Interesting mid-afternoon reception by W1VD over a daylight path. Thanks Jay. Overnight copies were seen on the F1AFJ grabber with evidence of much variability in the propagation and reports were gratefully received from PA3CPM and PA3FNY. (Top to bottom WD2XGJ WD2XES and VO1NA transatlantic receptions from the F1AFJ Grabber) 24 Good copy at 4X1RF F4DTL and PA3CPM. 25 Now using 100m wire at 15m. F1AFJ (AUDIBLE) PA3CPM DK7FC 26 Reports from DD7PC(Marco's first), PA3CPM and DF7KC. 30-31 1 kw 4.5 amps to the 100m wire. F4DTL reported good conditions. PA3CPM had an 11 hour copy. August LF Experiments with FP/VO1RL FP5EJ FP5CJ FP/VO1NA in St. Pierre. July: See page 49 of the July/August 2010 issue of The Canadian Amateur for an article outlining the first LF QSO in NL on the new amateur 136 kHz band. 15,16. Copy by PA3CPM. 17 Copy by RN3AUS 19: Reports from PA3CPM RN3AUS and F4DTL. 20th: A transmission of a few hours was received clearly by PA3CPM and RN3AUS in Moscow. VE1ZZ reported audible reception of the CW transmissions on 1,7 and 20th at 459,469 and 439 respectively. 21-25 Captures from PA3CPM showing strong sigs. 25: G4WGT reports good sigs and YO/4X1RF reported good sigs being received in Romania. March. 01 4.5 Amps 1 kW PA3CPM, VE3EAR G4AYT PA3FNY send reports. G3XDV remarks that this was the strongest signals he's seen from across the 'pond.' 02: PA3CPM DD7PC KU4XR DK7FC 03: PA3CPM F1AFJ DK7FC. 04 Copied WD2XNS CW ID 549 at 0304 UTC. That evening, TA QSO with Mike G3XDV. This was recorded by F1AFJ who along with W1VD, F1AFJ, DF6NM send their congratts. Well done, Mike! Then at 0255 W1VD heard 5 WPM CW from VO1NA. 05: TX 137.777 QSX 136.172 kHz until 0300 then TX 135.83 kHz CW at 5 WPM. 5th: Captures by M0BMU, PA3CPM. 6th-7th. Good sigs reported by PA3CPM, but no reports have been received for the 135.83 kHz CW. 8,9th 137.777 kHz followed by 135.83 kHz CW which was not heard by W1TAG, J. Davis and Ed Slidell south of the border. Thanks guys! 10th 0445 partial copy by RN3AGC at 5600km+. Sigs were audible at W1VD. 11th. Only traces seen at RN3AGC. 12: Dot 10. Copied by VE3OT DK7FC . 16-17: Copied by Gehard OE3GHB. Traces seen at 4X1RF: First Asian detection. 18: DFCW60 RF: 4.5 Amps 1000 watts. Clear copy by RN3AGC. 21 March. TA QSO with Markus DF6NM who was running 0.6 W ERP. 27: Reports from DK7FC RN3AGC and RN3AUS . 28: W1VD (audible) F5DTL. 29,30 and 31: Captures by RN3ACG with full callsign QRSS75 copy on 30 Mar. February. 27th: 1.6 amps 100 watts to 100m wire up 15m. QRSS30. 137.777 kHz F1AFJ reports strong signals. 28th: 1 kW with Decca amp: Several reports received: VE3EAR Bruce: strong capture; F1AFJ Jean-Pierre Good copy; G4AYT Chris: excellent 'O' copy much of the time; PA3CPM Henny: strong signal; G4WGT Gary: visible on my grabber from 2145utc to 0630 then just a trace shortly after. G3XDV Mike: huge signal last night from around 2200 - the best I have ever seen from across the pond; PA3FNY Victor: Good Copy. Signals seen on grabbers including DF6NM, VE2IQ. January: 184.5093 kHz 5 Watts 0.4 amps to 100m wire at average height of 15 metres. 2 Jan. Weak traces seen at PA3CPM. 3-5 Jan. Nil. 6th: PA3CPM copies parts of the V,1 and the letter O. strong traces by PA3FBY. 7th. Traces by PA3CPM. PA3FNY. 8: TX off until 1600 UTC. 9: weak traces PA3CPM. 10th bit stronger. 11th bit stronger again: Off air 13 Jan 2011. Oct/Nov. TX 184.5093 kHz. Henny PA4CPM monitoring around the clock. Weak traces reported on 15 and 20 November on 184.509 kHz. 22 Nov. PA3CPM Traces: The aerial is now about 15 metres average height (formerly 10 metres) and the temperature is -2 deg C which may be reducing dielectric losses. 24,25: More traces at CPM but nil on 26th. April: 26th 2216 UTC:CW QSO VO1RL/VO1NA 137.777 and 136.380 kHz. February: 5th 2100 UTC initial tune up. QRSS75 on 137.777 kHz,70 watts, 1.4 amps to 100m wire at 10m. Reports from Markus DF6NM, Jean Pierre F1AFJ, Nicolas F4DTL and Ko NL9222. The TX was switched on and operated during a major blizzard. The band is now available to Canadian amateurs per the Canadian Table of Frequency allocations . 20 Sept: 5 WPM 184.5 kHz signals copied at Cabot Tower, Signal Hill by VE3EAR. 1 August. 10 watts 0.44 amps to 100m wire at 10m. QRSS75. 184.5093 kHz. 1-4 Nil at PA3CPM. 2: Good copy by W1TAG in Maine 1430 km with 50*50' loop feeding R75. Best at 0740 utc. 6-11: Weak traces copied by PA3CPM except nil on 10th. 11-17: Traces reported by PA3CPM, except on 12th. 17: 5 WPM. Aural receptions in Bonavista Bay. July: Normal CW transmissions and local reception experiments: best range 427 km (all ocean path) 258 km (land and sea path). No copy in Labrador. April and May: Local reception experiments. 5 WPM 10 watts 184.5093 kHz. March: Nil at CPM 1st-10th. Antenna iced and down 2nd-4th. Good partial callsign at W1VD on 5th. Small traces at F1AFJ on 10th. 9th: Off for monitoring 500 kHz. 28,29: traces ar AFJ,CPM,FNY. 30: Traces at AFJ, CPM, FNY and excellent copy at VE1VDM (850 km away). 31: Vy weak at CPM. December: TX 184.5092 kHz QRSS75. 2 unid traces by pa3ego on 2nd,4th and by pa3cpm f1afj on the 7th and 9th. Henny and Jean-Pierre have been reporting daily with nil reports on the 10th. Our 2 observers having watched their screens with much devotion but little to report were finally rewarded on the 16th (Traces at F1AFJ) and the 17th when a spectacular copies were received. 18th: nil at AFJ and CPM. 19 traces at AFJ, CPM and PA3EGO. 20,21 JP and Henny had very good reception, but nil on following day with nil and slight traces being reported by PA3CPM, F1AFJ and PA3FNY until 31 Dec. Image above thanks to Jean-Pierre F1AFJ (22 Dec 2008). Image above thanks to Henny PA3CPM (18 Dec. 2008). November: 1 CT1DRP reports fragments. Traces at PA3CPM 2: Brian receives almost a full call sign, but nil at Victor PA3FNY, Jean Pierre , and Henny who did report a strong but fragmented reception at PA3EGO. 4: Fragments received by Jean-Pierre, Brian and Henny. 5: Nil at cpm, afj, questionable traces seen by Willem. 6: Fragments at drp, afj 7: nil at cpm. 8,9. Nil at cpm, afj. 10 Off air. 11-19. Nil receptions for Henny, Jean Pierre and Victor. 20: Weak traces at PA3CPM. October: 6th. Henny PA3CPM recording 24/7 and reported traces on 3rd, 5th and 7th. F1AFJ saw evidence of the sigs on the 6th. 8th: Traces at PA3CPM and this spectacular copy by Brian CT1DRP. 9th: Off air for a day. 11th: Strong copy at 2318 by W1TAG while in Maine. 12: Partial copies by CT1DRP, F4DTL with weak traces seen at F1AFJ. Victor PA3FNY and Henny PA3CPM reported no sigs seen. 15-17: Traces at FNY, DTL but nil at AFJ. 16: traces at CPM, nil at AFJ, DTL. 17: Partial at AFJ. 13 Nil at F1AFJ F4DTL. 14 Partial at F1AFJ but nil at F4DTL. 17th: Good copy by ear at VO1HP. 18 Nil cpm,afj 19 Nil cpm afj fny but fragments at drp. 20 nil at afj, dtl,cpm but fragments at cpm again. 20 TX OFF AIR. No sigs reported by cpm, afj and drp. 21 October. Frequency moved from 187.37475 to 184.5092 kHz. 23: Copies by Victor, drp, cpm but nil at afj. 25: nil at aff,cpm,fny,'almost imperceptible' at drp. 26: nil at afj, fragments at drp, vy faint at fny. nil at cpm. 27: nil at afj, cpm and fny. 28 fragments at drp; nil at afj,cpm. This is the first time an entire call sign was received across the Atlantic from this station on the 160-190 kHz band. September: 1 Nil at PA3CPM; 3 Traces at PA3CPM and PA3FNY; 4: Nil at CPM 7-30: PA3CPM reports traces on 7,9,12,19,20,24,25,29 and 29th, but nil on the other days. CT3DRP has started monitoring and received weak traces on the 12th with a very impressive and strong copy on the 13th. This is the first confirmed reception from Portugal. Congratulations Brian! Brian again reported fragments around 0700 utc on the 21st. F1AFJ had copied traces on the 27th. Jean-Pierre contributed the very stable PLL synthesiser that is making the carrier. The PA is a class E running 15 watts and 0.48 amps of aerial current to a 100m wire at 10m height. July: 2nd nil at PA3EGO, PA3CPM. 3rd: Traces at CPM. 4: Copy at CPM, 5th good copy at PA3CPM and PA3FNY 27-28 No copy at PA3CPM. 29: Weak traces at PA3CPM. June: On air at 2355 utc on the 4th. 5th: Henny PA3CPM sent an argo capture showing a succession of N's, the last one very clear. Conditions were accurately predicted to be good by Alan, G3NYK. 6th: Another capture but weaker from PA3CPM. 7-9th: No sigs seen at PA3CPM. 10-11th. Nil at PA3CPM despite Alan's favourable forecast. QRN on the rise perhaps? 12-14 Nil at PA3CPM. 15: Traces at PA3CPM! May: Still QRV 10 watts, 0.4 amps. Copied by PA3CPM on the 6th. Weak trace seen by PA3CPM again on the 11th, 12th but nil on the 13 and 14th. Traces of signals with an N or two resolved on the 15th and 16th but nil on the 17th. Weak on 18th. 19th. Switched to QRSS120. 20 Good capture of "NA" 21: nil. Weak traces on 22nd. Better on 23rd. Nil on 24th at PA3CPM but a trace was seen at PA3EGO. Unfortunately this could not be positively identified. 25-26: nil at PA3EGO, PA3CPM. 28-29 Nil at PA3CPM but weak trace on 30 June. April: Ice and wind brought down the aerial again. 25 metres was raised to 10 m height and tuned. The required inductance was about 3 mH. 14th: The remaining 75 metres was raised and the aerial retuned. A report of reception on 187.37475 kHz was received from John W1TAG. 16th: Thanks and congrats to Victor PA3FNY Henny PA3CPM and John W1TAG on their receptions of the beacon this morning. 17: One N captured by PA3CPM at 0000 UTC but nil on 18th. Henny captured a weak N on the 21st. March: 01. Transmissions resume on 187.37 kHz. The resolution of the F1AFJ synthesiser is such that the actual frequency is about 5 Hz high. QRSS 60, 0.4 amps 10 watts to 100m wire at 10m. 2-5: Nil at PA3CPM. G3NYK has predicted poor propagation. He appears to be accurate as usual. 12th. After changing to QRSS180, Henny PA3CPM copied the beacon again. February: 17th. Hartmut Wolff receives the 1600m again and Henny PA3CPM copies them for the first time. Congrats to both. The aerial current was about 0.4 amps with 10 watts for the transmissions. Frequency control was with the F1AFJ frequency synthesiser set for 184.006 kHz. 20th. Another reception report from Henny PA3CPM. F1AFJ reported on 184 kHz: Traces of WD2XEB/2 , nil for VO1NA 23: traces at F1AFJ. 25: Henny PA3CPM captures a succession of 3 N's. 29: Trace at PA3CPM. 20th. Another reception report from Henny PA3CPM. 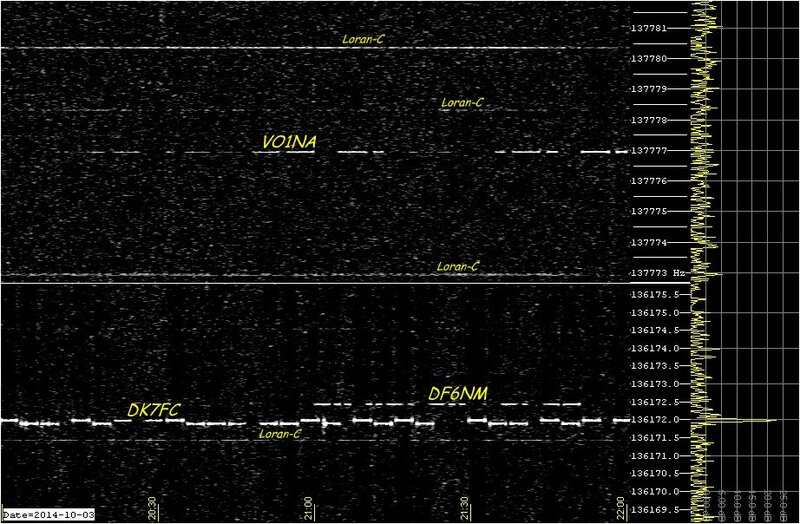 F1AFJ reported on 184 kHz: Traces of WD2XEB/2 , nil for VO1NA 23: traces at F1AFJ. 25: Henny PA3CPM captures a succession of 3 N's. 29: Trace at PA3CPM. January: Jean-Pierre, having monitored 189.9497 kHz for several months with only a possible trace of the signals seen on 15 December, suggests a new frequency. Transmissions resume on 184.006 kHz as reported by John W1TAG. on 15 January. 18-20 Nil at F1AFJ. Finally on 21 January, Jean Pierre F1AFJ reported seeing the signals. This was consistent with what was actually transmitted at that time so FELICITATIONS F1AFJ on the first reception in France of amateur signals from North America on 1600 metres. 22,24 traces; 27,27 Nil at F1AFJ. December: A report is being drafted for RAC/IC concerning experimentation on the 135.7-137.8 kHz band. Submissions from those granted special authorisations are welcomed. 16 December: F1AFJ reported weak traces just after 0100 and 0115 utc, the second looking much line an 'N'. These were likely signals from here. Good work JP. November. 189.9498 kHz dot 180 synchronised to UTC. 1-2 Nil at F1AFJ. Good news from WRC07 concerning a possible new 2200m band! 03-05 Nil at F1AFJ. 7th: 2200m proposal passed by WRC Committee 4 this morning but still no trace of sigs at F1AFJ. 8: Nil At F1AFJ 9th Nil at F1AFJ. WRC07 APPROVES A 2200m BAND! 10-11 Nil at F1AFJ. 12-15 Still no sigs seen at F1AFJ despite lower noise levels. 20th was off air for a few days, but back on again today, but still no reported receptions. F1AFJ reported no sigs on 21st but a weak trace at 0600utc on the 22nd. nil on 23rd. Beacon off 28 Nov 2007. Many thanks to Jean-Pierre and Hartmut for their reports. July/September: Brief tests on 160-190 kHz. 6 Aug: Copied 8 watt beacon (5 WPM CW,189.81 kHz) in St Pierre -- 274 km away; FP/VO1RL CW transmission on 136.369 kHz: 8 watt TX to 20m horizontal wire at 5 metres. Copied 1/4 km away. 16 Aug: Currently transmitting on 189.8101 kHz +-0.1 Hz 8 watts 0.4 amps to 100m of wire up 10m at approximately QRSS60. TX off 2222 UTC 14 September. SAQ/GRIMETON received in Canada, Using the R1119 receiver donated by VO1HP and the 100 metre LF aerial tuned to 17.2 kHz. Audio Clip The copy was consistent and quite good despite the strong FSK at about 18.2 kHz. June 08: DFCW120 137.777 kHz (-0.1 Hz shift). 2.5 amps at ~0015 then 4.9 amps (18A @@ 60VDC input) at 0110 utc. Copied by F1AFJ, W3EEE, W3NF, PA3CPM but nil at VE3EAR. 09: 4.9 amps again at 0001 UTC. 9,10: 4.9 Amps to aerial. F1AFJ, H. Wolff and W1TAG in Maine. 11: F1AFJ and PA3CPM reported good copies. 12th: Very good copy at F1AFJ. 13: 0000 and 0100 UTC: "NA" at DFCW120 followed by 10 WPM CW . Copied by F1AFJ, PA0RDT. 14: Good copies reported by PA3FNY and F1AFJ. 15: Off air. 18: 4.5 Amps to the aerial. DFCW120. Signal reports of strong signals were received from F4DTL F1AFJ and PA3CPM with good reception (in near real time) on the DF6NM site. 19: Strong copy by F1AFJ and AUDIBLE reception reported by F6CWN. 20: DFCW120 and 10 WPM. Good reception reported by PA3CPM and F1AFJ. 21: 10 WPM loud and clear at VO1CRC, but not heard by VO1TA, VO1UL nor VE0ZJ. DFCW120 was copied by PA3CPM, F1AFJ, PA3FNY and M0BMU who reported 30 dB S/N in 0.04 Hz FFT bandwidth. 22-24: Not transmitting. 26: PA3FNY F1AFJ F5CWN and PA3CPM 27: 40 minute transmission sequence was copied by F1AFJ PA3FNY PA3CPM and F5WK and H.Wolff. 28: Schedule- On 0040 off 0919 4.7 Amps RF 0.9kW DC input. Copied by G3WCB F1AFJ PA3FNY G4WGT PA3CPM W.DeRoode F6CWN and H.Wolff. 28th On again at 2337 4.7 A RF 0.9 kW DC. DFCW120. Thanks to a new pole XFMR installed earlier today, the lights do not dim so much when the TX keys. Good sigs seen on the DF6NM grabber via wireless internet in the tuning shed. 30: Signal reports for the QRSS30 farewell message were received from F1AFJ, PA3FNY, PA3CPM, and Hartmut Wolff who provided a copy of the entire text. VO1NA 2200m is officially decommissioned as of today. May: 01 High power transmissions DFCW (0.1 Hz) on 137.777 kHz. Good reception by F1AFJ on 1-4 May. 5: PA3FNY, F5WK 06: 5 WPM from 0001-0100 UTC then 2FCW120. 4.7 Amps 1.2 kW input. DFCW copied by PA3CPM. John W1TAG tried to copy the 5 WPM but there was too much noise for either visual or aural reception. 7th: 5 wpm 0001-0200 UTC followed by 2FCW120. 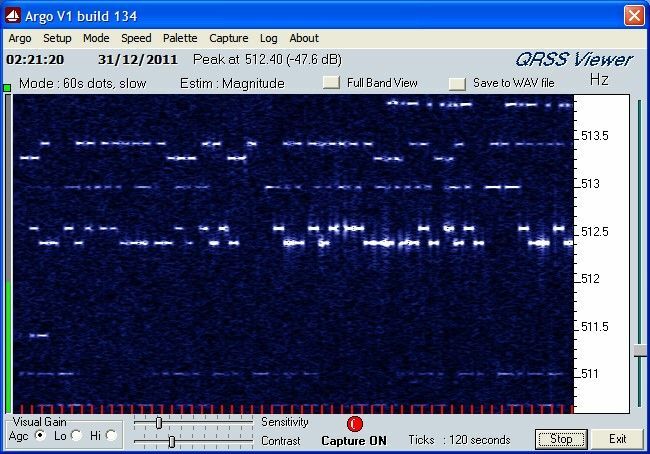 5 WPM Blur seen on QRSS3 by H. Wolff. 2FCW copied by PA3CPM. 8th: 5 WPM on all night. CW copied (heard) by Hartmut 0200-0300 UTC. Hartmuts Recording 12: 6 WPM 0001-1024 UTC. Copied by HW. 13: 0024 4.4 Amps aerial current. 6-2/3 WPM. Copied by H.W. 14: 10 WPM. 15: Off Air. 16: 2FCW 120 4.7 amps Copied by Alan G3NYK, Michel F5WK and Dave G3YXM. 17: 2fcw120 18: 2FCW at 0001 followed by 10 WPM 0200-0714 UTC. April: 01,02 Brief transmissions 4.5 Amps 1.2 kW input. Copied by Ed R6L. 5: Copied by HW (2040UTC) F4DTL and VE1VDM. 6: 12 WPM on 187.37 kHz 0.48 amps 1600-2000 then DFCW120 4.5 amps on 137.777 kHz. for several ID's, three of which were copied by NL9222. Copied by PA3CPM and F4DTL. 07: three transmissions at DFCW120. Copied by PA3FNY who provided a capture and another from last week showing degraded conditions for the transatlantic path as predicted by Alan G3NYK. Cpi by PA3CPM. 08: 88 minute transmission 11-30 April. 12 WPM on 187.37 kHz. 10 watts 0.48 amps. Heard at 360 km. March : 03-08 TX 137.777 RX 136.318 kHz +- 3Hz Received by H. Wolff and F1AFJ. Seen on W3EEE grabber. 11-12 March. 2.5 Amps from 1 PA module of Decca amp. 7A@@60V DC input. The brief FSK tests were reported by H. Wolff. 12-13: First DFCW transmission from here: QRSS120 with -0.1 Hz shift for dots. Hartmut's copy: 15 March: TX was shut down following blue fireworks near the top of the tower. 16-17 March. 3.3 Amps RF, 12.5A @@ 60V DC input for the Decca amp. DFSK120. Seen on DF6NM, W3EEE and F1AFJ grabbers. 18 Mar: Following work on the earthing system, 4.3 amps of RF were achieved with 1.1 kW DC input to the Decca amp. 19 March 549 Copy by VE1ZZ 2219 UTC. Day time reception of brief tests reported by W1TAG and W1VD. Seen on F1AFJ grabber at 2330 but shut down after winds causing arcing against the tower. 25-26 Brief tests at 4.3 amps FSK. 27-28 40 min DFCW transmissions at about 2200-0100 and 0630. Nil at ZL2CA, ZL4OL. 31: Tests with ZM2E as we try to link Quartz Hill and Wireless Hill by LF. Nil from ZM2E here, but good reports of sigs from here from W1TAG W1VD and VE2IQ. DFCW60 copied on W3EEE grabulator at 1800 UTC. Good copy reported by RU6LA. Solenoidal tuning coil and variometer replaced with a pair of Litz spider wound pies. Aerial current 4.5 amps with 17 amps at 60 VDC input to Decca amp. Strong daytime reception reported by W1TAG and W1VD. February. 03: 137.777 kHz 0.9 Amps 100 watts QRSS30 (approx) at 0200 on 03 Feb. 03: Copy on W3EEE grabber, traces at F1AFJ; Nil at F4DTL; 04: On 0313-1300 and 2132 UTC-1106. 03-04: HW G3NYK, F1AFJ Seen on W3EEE grabber. 10 Feb. Decca amp running on 1/3 PAs. 1.8 amps to aerial. 06: NA at QRSS90 starting 2330. 07: QRSS120 until 1018 utc. 09: N at dot 120. No copy at F1AFJ. DJ8WX copied here on 136.319 kHz. 11 Feb: 2.1 amps from Decca. NA at dot 60 every 36 minutes. 12 Feb. QSO completed with G3XDV. Mike was transmitting QRSS30 on 136.318 kHz with 200 mW ERP. 13: Good copies reported by F1AFJ, H. Wolff but paradoxically, nothing seen on the W3EEE grabulator. F4DTL reported reception. 15: 2 call signs sent with Decca amp. 2.1 amps aerial current. 15-19th: Good copies reported by F1AFJ, G3NYK. G4WGT. G3NYK H. Wolff. 19-20th. Received by H. W. 20 Feb. Nasty WX brings aerial down. Off air for now. 23 Feb QRV again. 2.7 amps on 137.7770 kHz. QSX 136.318 kHz +- 3 Hz Received by HW. 24-25: Erratic exciter operation was corrected thanks to the F1AFJ grabber. G3WCB reported reception also. January: The 137.777 kHz TX should be QRV by 03 Feb.
15-31 October 2006: Beacon moved to 1961.483 kHz (+-2Hz). Will resume LF operation on 137.777 kHz in near future. October: 10 watts 0.28 Amps to aerial on 187.37 kHz. 9 Oct Off air 10 Oct. On again. August 10 watts 0.28 amps 187.37 kHz, 10 WPM and QRSS180. Aural reception near Funk Island (about 200km). Received by H. Wolff on 17 and 29th. Consistent copy of QRSS120 by night in PEI (800km). 1 July 10 watts 0.3 amps 187.37 kHz, 10 WPM and QRSS180. No reports received as of 31 July. May 100 Watts from class E TX, 1.0 amps to aerial. The Decca is resting / 01 HW; 02 PA0RDT DF6NM HW; 03 HW; 04 F1AFJ (nil at F5YG) HW G3NYK; 05 G3YXM HW; 06 F1AFJ DL4YHF HW; 07 F1AFJ; 08,09 HW; 10 F1AFJ and G3YXM reporting weak sigs with good sigs at HW. ; 10 Again good copy by HW. 11,12 TX off. 13: Decca on ~0.5kW 2.5A/ DF6NM, H. Wolff (strong sigs) and G4WGT. 14 F1AFJ HW PA0RTD DF6NM G3NYK; 15 F1AFJ HW; 16 G3NKY, HW; 17 G3NYK; 18,19 G3NYK; 20 F1AFJ/ Now ~189.85 kHz 0.4 amps to antenna. ~QRSSS100. 22-23 0.4 amps 187.37 kHz/ Copied by VE3OT, W1VD, H. Wolff and W1TAG; 24 possible partial copy at AA1A; 25 Cpi by H.W. and another partial by AA1A; 26 Nil at HW but a more promising partial by AA1A. 27,28 W1TAG; 29 Brief Copy by H. Wolff; 30 Confirmed reception by AA1A. 30, 31. Nil at HW. 01 Jan QRSS120 starting at 2200 UTC. 1.2 Amps 70 watts to aerial. /01 Good copy of HNY at dot 30 by HW; 02: Very clear copy at 1300 UTC by HW. 03 Good and consistent by HW, partial by RU6LA; 04 partial at F1AFJ, nearly full 24 hr copy at HW; 05 F5YG, Strong at HW; 06-09 HW,RU6LA(8-9) (downtime on 8-9,10 for rx tests); 11 Strong reception by HW; 12 Copied by F6BWO and on the G3YXM and CT1DRP Argo captures, very strong at HW 1900-0830 UTC, all night copy by DF6NM; 13: Good at G3YXM, HW,briefly at DF6NM; 14: HW, DL4EAU, F6BWO, OZ7QC; 15 OZ7QC(traces), Good at HW despite high QRN; 16 Traces on the G3YXM grabber, Good copy by HW. Good reception here of CT1DRP and DJ8WX near 136.317 kHz and also on 17th. ; 17 HW; 18 F5YG; 19 (5 WPM from 2230(18)-0300) HW (0330-0930) and G3YXM (strong at dawn); 20 (QRSS30 & 5WPM) G3YXM M0BMU DF6NM; 21 HW PA0DRT; 22 70W 0.8A/Copied rpt from G3YXM. QSO with M0BMU. Spectra from M0BMU showing signals from the WD2XNS (top) and WD2XES experimental stations while VO1NA sends new year greetings and a good morning to Jim. A deep fade noted by HW, PA0RDT and G3YXM during transmissions of signal reports for YXM and BMU; 23 G3NYK G3YXM DF6NM HW; 24 G3YXM G3NYK F1AFJ and "impressive" copy at HW. The frozen ground likely reduced aerial losses. 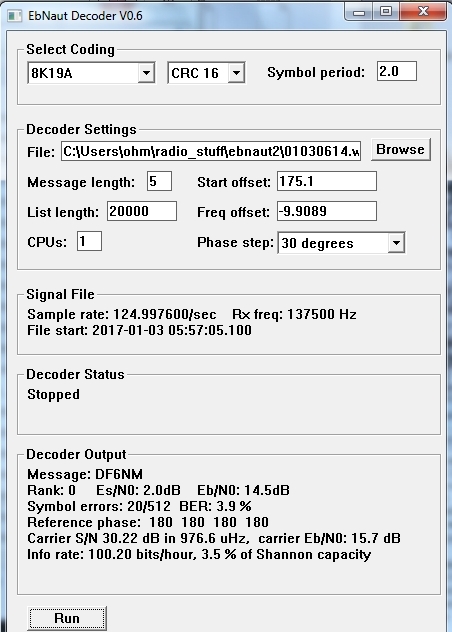 QRSS20. 24-25 2220-1030 UTC. Aerial:1.1 amps 100 watts, QRSS30&5WPM/F1AFJ G3YXM DF6NM HA6PX G3NYK PA0RDT, HW; 26 G3NYK G3YXM, DF6NM HW; 27 T>0 deg. L=1.86 mH(down 0.1mH) had to retune due to warm WX./Fair to good at HW. Traces but no cpy at PA0RDT; 28 F1AFJ PA0RDT G3NYK and HW (strong 5 WPM 'blur'); 29 F1AFJ F5YG HW G3NYK M0BMU traces at HA6PX; 30 G3YXM HW DF6NM; 31 G3YXM (early traces) G3NYK F1AFJ PA0RDT G4WGT Hartmut and F5YG. O1 December 2005 "NA" at dot 120 on the hour. 80 watts, 1.2 amps. /01 Strong at HW almost all night and some daytime traces; /02 Good cpi at G3YXM good/strong copy at HW with some fading; 03 fair to good at HW; 04 CR1DRP, G3YXM, H.W. receptions. 05: NL9222 reported sigs. Good at HW; 6 DJ8WX, CT1DRP and HW who also received "NA" at 1900 UTC (NB local sunset 1939 UTC); 7 Partial cpi by F1AFJ, traces at G3YXM and CT1DRP. Good cpi by HW; 8 HW; 9:traces at HW starting 1800 then strong, G3YXM; 10 Strong at HW, G3AQC. 12 CT1DRP,HW; 13 VE3EAR, Consistent throughout the night at HW. 13 good at HW; 14 Weaker at HW; 15 traces at G3YXM good at HW; 16-18 HW; 19 F1AFJ, HW, OZ7QC; 20 HW OZ7QC; 21 Traces at G3YXM. F1AFJ, HW(very strong), M0BMU; 22 G3JKV M0BMU G3WCB and HW (not as strong as on the 21st); 23 F1AFJ(strong),F6AQR,HW,G3JKV,CT1DRP,G3YXM. Stronger signals could be result of low temperatures (about -10 Celsius); 24 F1AFJ,HW. Vy patchy at G3JKV and DF6NM; 24 PA0RDT; 25 HW; 26 F1AFJ, HW and OZ7QC copy Christmas greetings on 137.777 kHz. 27-30 QRSS20 copied by HW despite high QRN recently. . 31 HW and W1TAG copy Happy New Year greetings at QRSS30. 01 November. "NA" at QRSS120. / Cpi by HW, trace by G3NYK. 2-4 cpi at HW. 5 Nil at HW. (more likely a result TX accidently off than conditions. 6,7 Variable cpi at HW; 6th: remarkable daytime copy at HW; 8th variable in morning and again a day time copy. Also traces by G3NYK; 9,10 Some good copies at HW; 11,12 Weaker at HW. Traces at G3NYK.13 Brief cpi at HW. 14 Strong copy at HW and identifiable elements at G3NYK; 15,16 Good copy by HW for most of the nights; 16: copied by G3NYK at 2100 then faded; 17 strong copies by K2ORS and G3NYK; 18 Good at G3NYK and G3YXM; 19 Good at G3AQC, HW. 20 G3XDV, HW, G3NYK; 21 Traces at NYK; 22 NYK, HW; 23 traces NYK Strong at HW and daytime copy. 24-25 Fair HW. 26 HW and from the west, JR. 27 HW, VE3EAR. 28 Good cpy at HW almost all night. 29: Again strong cpi by HW almost entire night. Cpi also by G3YXM; 30: Strong cpi all night at HW. 24 October 2120 UTC. "X" at QRSS120 1.2 Amps 80 watts/Good copy of long element by G3NYK. Cpi by HW strong at times. 25: fair HW. 26: strong:good at HW 27: Good at HW. 28: strong at HW then early evening detection at just after 1800 UTC; 28 Seen at 1850 UTC by HW. 29 G4WGT cpt, F1AFJ Detect Strong at HW with Daytime detect from 1230-1430 and copy at 1820; 30 Copy at NL9222. Some experimentation with QRSS60 before 2100 was detected by HW at 1750 UTC. Resumed QRSS120 at 2100 UTC; Strong cpi at G3NYK; 31 Good cpi at HW. 3-21 October. NA at QRSS120. /3 Good cpy by HW, partial by W3EEE, 4 traces at HW; 5 weak copy; 6 nil; 7 trace; 8 trace; 9-11 weak. Good copy reported by G3AQC on the 11th. Good copies by Hartmut and G3AQC on the 12th; 13 Cpi by HW; 14: Weak at G4WGT. HW; 15 Cpi by G3JKV, HW; 16-17 Good copy by Hartmut including early evening copy around 2030 UTC before local sunset which is 2039UTC. Also on the 17th traces were copied by Markus DF6NM. End of twilight is 2110UTC; 18 Good reception by Hartmut and and Laurie G3AQC. 19,20 fair at HW; 19 Visible at G3AQC; 20 Traces at G3NYK 21: copy by HW in morning and at about 2030. 21 Sept.- 3 Oct. VO1NA at QRSS30. 1.1 Amps/ H.W reports: 21 traces; 22 partial copy; 23 copy; 24 partial; 25 Good cpi; 26-27 traces. 1-20 September. NA dot 60 0.8 Amps/ 01: nil at HW. 05 Sept. Aerial work completed . Current now 1.1 Amps. H.Wolff reports: 03 Faint traces; 04 Traces and one copy; 05 no trace; 06,07 weak traces; 08 Good copy; 9 Traces; 12 nil; 17 Weak copy in evening; 19 Brief copy; 20 Weak copy along with XES and XGJ. 21 weak trace; 22 Partial cpy; 23 copy; 24 partial 25 cpy; 26-30 trace; 01-02 Oct. Weak trace. 25-31 Aug. On at 0030. "NA " at QRSS60. Aerial current ca. 1 amp. /weak copy by HW before 0000utc 29th. 30: No trace at G3NYK or H.W. 31: weak trace at HW. 23 August. Off air at 0950 UTC due to electrical storm. 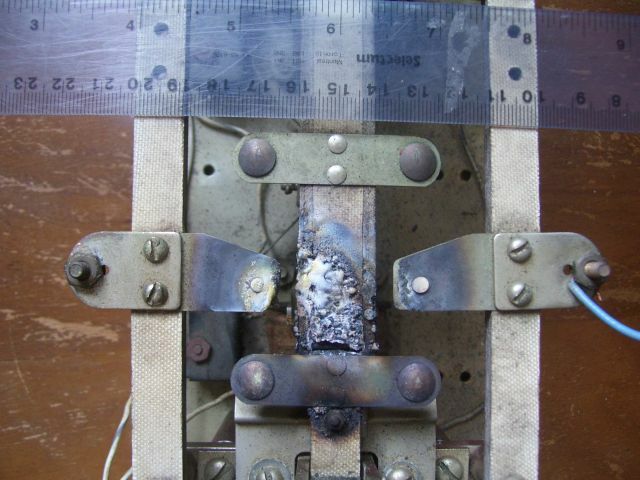 The wet ground resulted in an increase in aerial current from 0.8 to 1.0 amps. 16 July-23 August. QRSS30 on hour, 5WPM on half hour. /Reports of reception by HW for 1-4 Aug and 27,26,24,22,16 and 14 Jul. Many receptions by H. Wolff as outlined on his web page and reports by G3NYK on his propagation page. While in Cavendish, PEI, VO1NA copied traces of this signal along with some good copies of WD2XES,XGJ amd XKO. 08-15 July. 0.9 amps. 100 metres of wire at 10 metres. Earth connection is 150m counterpoise, 2m copper ground rod and 2 cement encased wires. Weak partial reception by HW and G3AQC on 08 and 09 Jul. Copied at G3NKY on the 9th. 10. Good cpi at HW. G3NYK 0110-0330 UTC. 11. Nil HW. 12: Weak partial at HW, Nil at G3AQC. 13: Weak trace at HW. 14: fair copy by HW. 05-07 Dot60, 50 watts, 0.9 Amps. /05, 06 Clear partial at H. Wolff, good copy at G3AQC. /07 Nil at HW, G3AQC,G3NYK. (Earth is a counterpoise wire under the aerial)10.good sigs at G3NYK. 04 July 0000-1000 UTC. QRSS60 137.777 kHz at low aerial current. 25-26 June QRSS2 N and 5 space bits on 189.85 kHz at 5 watts for a temporary ARRL Field Day demonstration. The new shed now has headers installed for the feedthrough bushing. 1-17 June. QRT during station renovation. 23 June. Renovations near completion. QRV in about a week. 13-31 May. 5WPM/Dot30 as before. 13: Weak copy at HW. 14: Traces at HW. 15: G3NYK predicted poor condx in severe geomagnetic storm: Kp=9! 16,19: No traces at NYK. 19: traces at H.W. 20 No trace at HW. 21,23-25: traces at HW. 23: traces at G3NYK. 26-27 Good copy by Hartmut. 27 copy at G3NYK. 28:traces at HW. 31: traces at HW. TX OFF at 0030. 12 May. TX without aerial! The final amp (class E) didn't seem to mind at all. 20 Apr-11 May. QRSS30 on hour,5 WPM on half hour, 24 hr. Local reception tests. 137.777 kHz 1.4 Amps 90 watts. 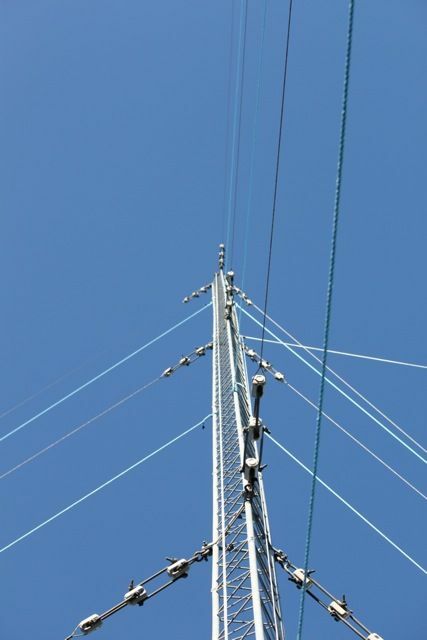 Aerial current decreases with increasing temperature, possibly a result of the increased dielectric losses in the soil and vegetation under the aerial. / 20: Good copy by HW and NYK of dot 30. 21: Strong sigs at NYK and HW. 22: Despite low aerial current, strong sigs rec'd by HW and NYK. Also seen at DF6NM. 23: Strong at HW 24,25 : weaker at HW 26: Strong at HW. and good at DF6NM. 27: Weaker at HW and DF6NM. 28. Better at HW. 29: Strong at HW. No trace at DF6NM. Copied by F1AFJ. 30: traces at G3NYK G3YXM. Good copies by H. Wolff, DJ8WX, DF6NM. 01 May: HW DF6NM G4YXM. 02: Traces at DF6NM. 5,6:G3NYK H.W. 7: HW 8: trace at NYK and strong at HW. 9: weak at HW. 1-19 Apr. QRSS120 / 1: HW, NYK 2,3:HW NYK 4: early detection by NYK. Good copy by HW. 5: Copy at HW not as good presumably a result of a coronal hole event reported by G3NYK causing Kp7. 6,7: Spotty copy at HW. Traces at NYK. 9th: start 0140 UTC. 8,9,10: variable, better and good copies at HW. 11: good throughout night by HW. 12-13 variable and good at HW. 14: Spotty copy at HW, traces at NYK. 15: HW until 0500. 16: Better copy at HW, traces at NYK. 17 QRT. 18: Copied by DF6NM, G3NYK 0400-0530 and H. Wolff 2300-0400. 19: Good copy by HW, G3NYK and G3YXM. 28-31 Mar. QRSS120 /29:O by H. Wolff, G3NYK. 30: H.W., G3NYK, traces at OZ7QC. 31: Copies by HW and G3NYK. QSO attempt with RU6LA: a partial copy of Ed's QRSS30 transmission. 25 Mar QRSS30 starting 0330 UTC. 18-20 Mar. / 18: O at H.W. /19 O at G3NYK/H.Wolff, Trace at DF6NM. /20 Strong at HW. 21: Good copy at G3NYK and by HW. Off at 1000 21 Mar. 16 March. Industry Canada LOA received. Transmissions will resume on 137.777 kHz QRSS30 at 2359 UTC. /17: O at H.Wolff. 9-14 March 2005. QRSS120 on 189.850 kHz +/- 0.5 Hz. 5 Watts out. Now using Colpitts osc which is more stable, but still drifts a bit. 7 March 2005. 189.81 kHz +/- 1 Hz and the usual QRH, QRSS~120. 24 Feb. Jim Dean of RAC endorses the proposals for continuing the experiments which included some helpful suggestions from Ken Pulfer. The Industry Canada LOA was requested for one year starting 1 March 2005. In the mean time, experiments are being conducted on 1600 metres (189.81 kHz) under a different LOA from Industry Canada. TX: 5 watts output, 0.4 amps to a 100 metre wire. Reception reports have been received from K2ORS and W1TAG in MA and W1VD in CT. Despite the very high QRM from commercial broadcasting in EU, Hartmut Wolff has also received the signals. This is believed to be the first transatlantic LF QRP signal and the first transatlantic 1600 metre signal (160-190 kHz band). More information is available here. 20 Feb. Dot 30 1.6 A 90 Watts. Good copy at G3NYK and H.Wolff in morning. Evening: G3NYK, K2ORS and H.W. QRT at 0200 UTC 21 Feb pending authorisation renewal. 18-19 Feb QRSS30/5WPM 0000 utc The ice on the wire has melted. I=1.2 A. 18. Good copy at H.W., G3NYK. Off at about 0200 19 Feb.
16-17 Feb QRSS30/5WPM 2315-1030 utc /HW good copy. Brief good copy at G3NYK in QRN. 14-15 Feb. Aerial drooping and laden with about 2cm of ice. Despite the reduction in aerial current, Hartmut has copied the signals on 14 Feb. 15: strong sigs reported by H.W. Fair at G3NYK. Off air ~1100 15 Feb.
6-12 Feb. QRSS120 137.777 kHz Frequency trimmed down from 137.77706 Hz. Aerial:0.8 A TX: 50 Watts into new (temporary) aerial. / Traces at CT1DRP, Solid copy reported by G3NYK. Good copy by H.Wolff. 8: Good copy at HW for about 1 hr. Traces at G3NYK. 9: No reports. After some aerial work the current increased to 1.2 amps. 10: Traces by G3NYK and CT1DRP along with my WD2 colleagues XDW XES and XGJ. TA conditions are generally poor according to G3NYK but Hartmut managed to get a good copy before his sunrise. 11: T less than 0C and aerial current up to 1.45 A. QRSS30 copied by HW. and G3NYK. 12: Good at HW and at G3NYK. Alan has predicted improved conditions and on the 13th the signals were copied at good strength at G3NYK and by HW. Traces at CT1DRP. Hartmut had a copy in QRSS3 mode. Mother Nature is evidently quite irritated with what appears to be a restoration of regular TA receptions in spite of her short lived success in putting the station off the air on 24 Jan... She has iced my 100 metre aerial wire and it might not survive today as the freezing drizzle storm continues. 6 Feb. Good copy from SM6BHZ and traces of 2-3 others. 5 Feb. Temp > 0 deg and aerial current is very low. No transmissions today. Sorry. Fair to good reception here of YU7AR. 29 Jan- 2 Feb. QRV on 137.777 kHz QRSS120. Much reduced ERP from a 160 metre long 1.5 metre high beverage aerial. A better system is being contemplated. /30 weak traces reported by H.W. 31: weak traces by CT1DRP and G3NYK 01 Feb: Amazing copy by HW of the memorial message in memory of VO1BL (1914-2005). Traces detected by G3NYK. Good copy here of SM6BHZ and DJ8WX 02: Good copy by HW of the memorial message . 24-29 Jan Monitoring 2200m for signals. So far, very good copy of WD2's XES and XGJ. No TA sigs copied since G3LDO. 24 Jan. Aerial iced at 1200. TX shut down. Mother nature delivers crushing blow at 1330 with catastrophic aerial damage but no injuries. QRT until further notice. 23 Jan. QRV 1630 UTC. QRSS30. (Removed 21 mm diam. ice with big stick and much determination!) /G3AQC 23rd at 1930 UTC. WD2XGJ reception here on 23rd before aerial deicing. 22 Jan. Raging blizzard. Aerial still iced and sagging. High winds. TX still off. 21 Jan. TX still off. Aerial is still up but iced. Forecast: no warm WX until Monday, 24th. Blizzard tomorrow. 20 Jan. TX off as a result of malfunction, possibly due to WX. 2040UTC: inspected feedpoint. Considerable ice encrustation of tuning apparatus and the entire length of the wire aerial which is now about 1 cm thicker due to ice which is likely detuning the aerial. Will wait and hope wire stays up until the ice melts. 18 Jan. Back on Diode Matrix ID at approx. QRSS30. Power output varies with temperature. 120 Watts at -10C, 75W at 9C. At least sigs can still be seen across the pond on Brians CT1DRP grabber with 75 watts out. The beacon is on 24 hours. /18. Only traces at H. Wolff and G3NYK. Alan is predicting poor long distance conditions until about the first part of February. /19-20 Very weak (-20dB) at G3NYK. 13-18 Jan. TX QRSS20 on hour starting 2200. RX 135.922 kHz. /13,14 Copied by HW. 15: HW, G3NYK (Alan is predicting a decline in conditions over the next few days.) 15-16 Signal report (T) from G3LDO but no QSO. 16 Jan. Aerial work: A loading helix and variometer were installed at the feed point. The current and relative field strength remained the same as when the tuning was done in the shack, about 100' from the feedpoint. More tuning inductance was required (2.3 mH vs 1.2 mH). Copied by G3NYK G3XDV H. Wolff. VE3OT 17th: G3NYK, H.W G3LDO Received here during TA QSO Attempt 16 Jan.
09 Jan QRSS10 0245-1500 UTC. / 9:M0BMU,G3NYK,H.W. and CT1DRP. 10: HW, M0BMU, G3NYK 11: M0BMU G3NYK CT1DRP DF6NM HW. 07 Jan 2005: QRSS10. / G3NYK, CT1DRP, H. Wolff, G3XDV and G3YXM. 01 Jan 2005. QRSS60 New Year greetings copied by Hartmut and seen at CT1DRP. 02: QRSS120. Copied at CT1DRP, strong at H.W. 03,04: Traces at CT1DRP, good at HW. 05: OZ7QC, G3XDV and DK8KW. 6: Copied by G3XDV who reported QRSS10 could be copied. Received by H. Wolff at 2030 UTC. and on the 7th. Copied by G3XDV and HW. 29-31 Dec. Wind/Ice damage to aerial repaired. On the air again QRSS120 2035 UTC. 29: Strong sigs reported by H.W. 30: weaker at HW 31 Good copy by HW. 25 Dec. "MX " at QRSS120. The Christmas greetings were copied by H. Wolff, G3NYK and G3AQC. 28 Copied by G3NYK and OZ7QC. 22 Dec QRSS120. Copied by H. Wolff. As a result of possible arcing the beacon will be operated when it can be supervised. Antenna work is planned over Christmas. 24: Copied by CT1DRP along with WD2-XES,XDW and XGJ. 24th: Copied by G3AQC G3NYK and G3XDV. 19 Dec. QRSS120 for several hours until shut down due to TVI indicating possible arcing. QRT until problem is found and corrected. Copied by H. Wolff. 18 December. QRSS30/5WPM as before. 18 Good copy by G3NYK 19th: Good copy by HW. 27 Nov. - 16 December. QRSS30 on hr, 5 WPM on half hr. 27: generally poor reception at H. Wolff. 28 Nov poor at H. Wolff 29 Readable at M0BMU, visible at DF6NM, H.W. DJ8WX 01 Dec best since 8 Nov a H.W., Trace at M0BMU 02 Good at M0BMU 03 Good at G3NYK 05 Good at H. Wolff (G3NYK: 7th: Good 02-0300 but poor after. 9th: poor in noise. 10th very poor 11: poor 12 poor copy.) 14: good copy at HW. 9 Nov.(Kp=8) Resume QRSS120 at 2315 UTC. 10:(Kp=9) Very weak unidentified traces seen by HW between 1100-1400 UTC. 13: Copied by HW 1830-2040. Off 0156 14 Nov.
3-7 November QRSS120 137.7770 kHz. 3: copied by H. Wolff. 4 Copied by HW in heavy QRN. Detected until 0915. 5: Copied by G3NYK but with deep fades. Generally poor copy by HW. 6: copied by G3NYK and detected at 1100. Also copied by HW 1830-0900 with weak copy 1300-1400. 7: Copied by HW with and detection during daylight. 2 Nov. QSX 135.922 +- kHz QRSS30. 26 Oct-1 Nov QRSS120 Starting 2300 UTC 26 Oct. 27:Copied by G3WCR, H.W. and G4WGT: 28: Copied by G4WGT, G3NYK and G3XDV who detected it until 0900 UTC. and H.Wolff who detected it at 1830 (27 Oct) almost 2 hrs before local sunset at 2020 UTC. No trace at ZL4OL. Traces seen by HW at 1845. Strong since 1945. Seen on CT1DRP grab 2230. 29: Copied at M0BMU along with XDW and XES. Good copy reported bu G3XDV. Amazing copy by H. Wolff 1300-1500 UTC. 30: Copied by M0BMU, G3XDV, H. Wolff and a remarkable O copy by W1TAG from 1:00-4:00 PM Boston time. 31: Copied by W1TAG, G3XDV G3NYK and H. Wolff. 1 Nov. Copied by OZ7QC. Daytime (1200-1400UTC) reception and good copy reported by H, Wolf. Good copy by G3NYK in QRN and by G3XDV. 25 Oct. QRSS30 starting 2200 UTC. O copy for most of night by G3NYK H. Wolff, G3XDV and G4WGT. 23-24 Oct. Attempt for TA with RSGB HFC. Nil cpi. Beacon QRSS10 at 0100. 24: Reports of good reception from H. Wolff, M0BMU and DF6NM. 25 Good reception reported by G3XDV and H. Wolff. 5-22 Oct. QRSS30 on the hour, 5 WPM on the half hour. 137.7770 kHz. 5th: Copied by DJ8WX. Best at 0558-0630. Sunrise 0614. Copied by G3LDO. Also copied by H. Wolff but not as well as previous nights. 6: Copied by DJ8WX. 0558-0630 was best. Clock is a bit fast. Also copied by H.W. and M0BMU. 8: copied by HW and KI0LE. 10: Copy by HW 12: HW and OZ7QC. 13: copy by HW at 0500-0530 in heavy QRN. 14: No trace at OZ7QC. Good cpi by HW. 15: Cpi by HW in QRN 16: early cpi by HW at 2100 UTC and fair thereafter, improving by dawn. 17: Detected at 2020UTC by HW. 0.2uV/m at DF6NM after 2200UTC. 18: Weak at OZ7QC and good at F5MAF. Copied by HW starting at 2020 UTC and by G3NYK then QRT. 20: Traces seen on CT1DRP and G3YXM screen grabs. Traces and good dawn copy by G3NYK. Traces seen by HW at 2200-2230 in heavy QRN. 21 G3NYK reported heavy QRN over much of Europe. Good cpi by HW. Detected until 0730. 22: Good cpi 2100-2130 but fading thereafter at HW. Good cpi at G3NYK with traces detected until 0820 but interference from rain static. Good at G3XDV 2100-0700. Copied by M0BMU. 27 Sept - 4 Oct. QRSS30 on hour, 5 WPM on half hour. 137.7770 kHz. 9: copied by HW. 10: Copied by HW, W1TAG. 27: Good reception by Hartmut from 2300-0530 who also copied WD2XES. 28: Traces at 0000 UTC and O copy at local dawn reported by G3AQC. 29: Traces by OZ7QC; Good copy by Hartmut including partial of 5 WPM. 30: Good copy early but poor later reported by G3YXM and H Wolff. 30/01: Copy 2100-2130 30 Sept. Traces until 0530 reported by H. W. 02: O Copy H.W., OZ7QC, vy good copy reported by G3AQC. 03: Excellent copy reported by H.W. who also copied WD2XES. 04: Copied by DJ8WX. Good copy seen on CT1DRP grab and by H.Wolff. 19-26 Sept. 2300 UTC. Resume usual operation. 20: Good copy by VE3OT (London Ontario) and H.Wolff 0000-0330 UTC, although weaker than previous nights. Weak signals at KL1X in Oklahoma 3700 km away. Only 670 km of the path was over water making this a new distance record for reception over land for this station. 25 Copied by H.Wolff 26 Copied by HW and DF6NM. 22 Good copy by H.Wolff and G3AQC. 23 Copied by HW, but weaker than 22nd. 24. Traces on CT1DRP grab at 0430. 25. Traces at G3AQC, copy at OZ7QC. This is the first report received from Denmark. Also copied by HW. 10-18 Sept. 100 watts. QRSS30 on the hour followed by 5WPM. 137.7770 kHz. 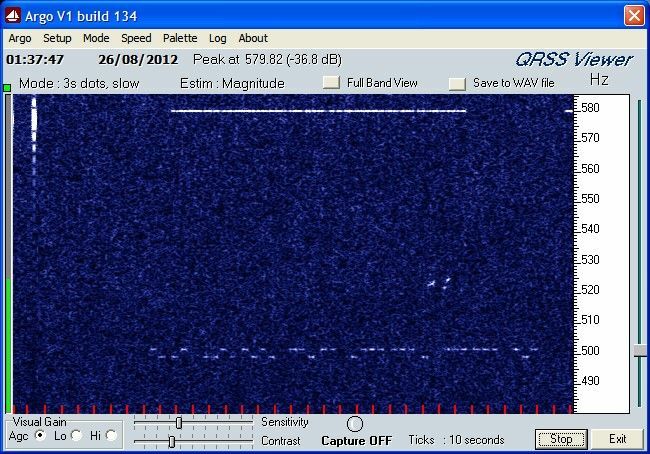 From H. Wolff: O copy of the QRSS30 signal 2215z-0515z 11th/12th of September. The QRN level was a bit higher last night due to several thunderstorms over western Europe. The signal reaches around 0315z 18dB above the noise level. Fade out of your signal was 30min after local sunrise here. Also copied by M0BMU on the 12th. 13th: Very good copy by M0BMU at 0500 with clear evidence in his trace of the 5 WPM transmission immediately before the QRSS30. Good copy reported by G3YXM. 14th: traces in heavy static reported by H. Wolff. 15th,16th,18th: Good copy of Q30 by H.W. QRT for QSX 18-19 Sept.
31 August. Captured W1TAG (John's) WD2XES while in PEI. First 2200 m reception in VY2? 21 August-10 Sept. Using an experimental Class E (IRF9540 N CH MOSFET) at reduced power output (10 watts). 28 Aug. Almost complete copy reported by H. Wolf from 0300-0330 and traces on the 30th and on the 5th and 6th of September. 22 Aug 2004: Frank VO1HP, operating MRCN station VO1MRC completes QSO on LF with VO1NA on conventional CW (20 WPM). This is the first Amateur VO LF QSO and the first Canadian 2200m 2-way QSO using conventional CW. 12-20 August. Reverted to original aerial configuration with ATU in shack. Start TX 2100 UTC QRSS30 and 5 WPM 137.7770 kHz +- 0.1 Hz. 13 Aug. Good reception by W1TAG/P in daylight in Maine. Fragments at CT1DRP and detected by H. Wolff. 14: Spotty copy for most of night and full copy at 0400 at M0BMU. 15: Better copy at M0BMU. 13-16 Poor reception at H. Wolff, but better around 2300 UTC. 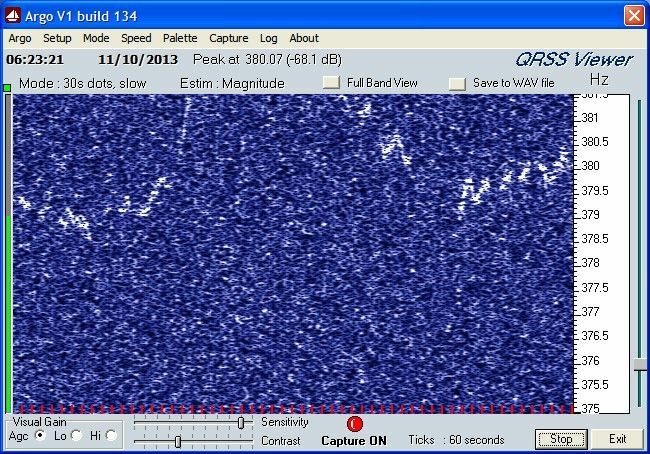 17: Only faint traces at M0BNU, visible at DJ8WX who reported nil on previous nights. 20 Nil for past few nights, consistent with predictions of G3NYK, then copied by H. Wolff 2300 (19th) to 0430 UTC. 6 August. Thanks to a new FET and fuses, the TX is now operational. It is hoped that the beacon will be QRV again following more ATU work. 18-25 July 100 watts 137.777 kHz 24 hours/day, dot 30 and 5 WPM. A different aerial/ATU arrangement is being used. The ATU is now at the near end of the wire. Aerial tuning was less than optimal and after a few days on the air the FET became fried. This FET had provided over a year of fine service despite the high duty cycle and several episodes of abuse during aerial matching exercises. 20 July good copy at W1TAG of QRSS30. Best reception at 0600-0630. 21: Good reception by H. Wolf. 14 July 0030-0130 100 watts 137.7770 kHz for FS tests. 26 June-6 July 3 watts, "VO1NA" at 20 WPM on 136.4 kHz for local reception tests. 31 May, 6 June . 2100-2300 UTC. 5 s of silence 5 s of carrier followed by "VVV LFEX DE VO1NA AR" at 20 WPM as a beacon for testing of loop aerials at 7 km from TX site. 11-25 May: 0000 UTC QRSS30 on the hour, 5 WPM on half hour, 24 hrs/day. 20 Apr-3 May. QRSS30 starting on the hour followed by 5 WPM, 24 hours/day. Reports: 20th: MOBUM-good copy of Q30 from 0000-0530; 5 WPM a 'diffuse smudge' RN6BN-T/M copy 2310-0320. 21st: H.Wolff-reported AUDIBLE 5 WPM signals and good copy of Q30 2300-0430. 22nd: H.Wolff-O copy 0000-0430 traces of 5. RN6BN-clear fragment. 24: H.W.- copy 5 at 0150 F5MAF-O at 0455; EA4BVZ-trace. W1TAG-good copy of Q30 at 4:00 EDT. 25th: H.W.-traces of 5 0240-0300. 26th. partial 5, O 0000-0030 Q30; G3LDO O Q30. 19 Apr. 5 WPM 137.7770 kHz from about 0000-0100 UTC. Traces at M0BMU, H. Wolff. 18 Apr. QRSS0.5 137.7770 kHz from about 0000-0100 UTC. Traces at M0BMU. 17 Apr. QRSS30 137.7770 kHz from about 0000-0100 UTC. 17th: Good copy at VE3OT. Solid copy at M0BMU. Traces by H. Wolff. 5-16 Apr. QRSS30 137.7770 kHz 0000-1000. Copied by H. Wolff on the 5th and 6th but mostly traces. His copy on the 7th and 8th shows signs of improving conditions and was consistent during his darkness hours. From M0BMU: 5th - "O" copy at QRSS30 from about 0050 - 0500utc; 6th - 1 complete callsign visible between 0430 and 0500; the rest of the night only broken traces of dashes visible; 7th - Sigs visible from 0100 - 0530, mostly "O" copy, but some QSB From G3NYK propagation page: 7th:weak signals were detected at 0110z, improving in strength at 0300z, a very good "O" string received at 0420z and good string but weaker and fading at 0520z. 9th:Hartmut: Consistent copy 0050-0430. From the 1st segment started around 0000 and after 0430 only traces. M0BMU: 08 April - High QRN level. Signals visible from 0230 - 0530utc, "M" to "O" copy with QSB. There appeared to be 2 dashes missing from the "1" transmitted at about 0340utc 09 April - Higher QRN levels. Sigs visible at "M" copy 0000 - 0030utc, then only occasional characters until 0500, when one�complete call seen at "O". Faded out at 0530. G3NYK 9 Apr 2004 Fading was noticeable on Joe VO1NA's signal, after "M" copy in local noise at 0015z to faded to "T" or right out until about 0320 when it came in at "O" again until 0450z the final trace seen at about 0550z. 10th. Good copy at G3NYK, conditions about same with H.Wolff who copied throughout night. 11th April. Very good copy by Hartmut. Good sigs reported by G3NYK. Detected by RN6BN. Good sigs also reported by G3NYK at 2330 UTC. Solid copy at M0BMU 2330-0530: FS = 0.05 uV/m with SNR 20 dB over 0.04 Hz. 11-12. Solid reception at G3NYK from 2315 to past dawn. 13th. Good strong reception by H. Wolff and Alan G3NYK until 0505 UTC. 14th. Reports of good reception from H. Wolff and DF6NM. From M0BMU 12 Apr :Visible between 2340 and 0540, M/O copy, with deep QSB around 0200 and 0420 13 Apr: Visible between 0000 and 0500, mainly O copy apart from some QSB around 0100 14 Apr: Visible between 0140 and 0500, M/O copy, with a period of QSB around 0400 The noise levels here have been quite low in the last few days, but signals have been several dB down compared to the weekend. 15th: Poor copy at G3NYK. Trace at RN6BN. 16th: G3NYK "received good signals ... for most of the night starting about 0030z through to last "O" at 0450 and a trace at 0510" Detected in NE Oklahoma by Laurence KL1X. 4 Apr. 0000 UTC TX on 137.77637 kHz (according to John W1TAG). Testing VXO and new keying software. Copied by H. Wolff who reported poor conditions and by Jim M0BMU. No copy at G3NYK. 2-3 Apr. QRSS30. 2330-1000 UTC. Copied by H. Wolff, Jim M0BMU, and Alan, G3NYK who both noticed the absence of the sigs when I was watching for XES on 137.779 kHz and forgot to TX again until 0330! 1 Apr. QRSS3 beacon; 2 Apr. 5 and 3 WPM, QRSS10 at 0118 UTC. 3rd: O copy by M0BMU in QRN. Good copy here of WD2XES (W1TAG). 1 apr. Detected by G3NYK who observed periodic fading (about 1 hr cycles). Copied by H Wolff early in the morning. 2 Apr. Copied by H Wolff at QRSS3/10. Detected by Alan, G3NYK. 1 apr. Nil at M0BMU 2nd: M/O copy of QRSS10. 26-31 Mar. TX 137.777 kHz 2300 2330 0000 ... RX 2315 2345 0015... QRSS10 then QRSS1 beacon (27th) QRSS0.5 (2.4 WPM) on the 28th-31st. 27th: Hartmut reported partial copy at 0200 and Jim M0BMU reported O copy at 0500 of the QRSS1 sigs. First LF TA at 1 WPM! 28th: Copy at of QRSS10 by M0BMU and Hartmut, only weak traces of 2 WPM. No trace at G3NYK. 29th: Good copy of QRSS10; traces of 2 WPM by Hartmut. . 30th: Good copy of QRSS, detection of 2.4 wpm by Hartmut. Good copy of 2.4 WPM by M0BMU. 31st: Hartmut: Copy of QRSS10 only. Poorer conditions. Nil by M0BMU in QRN. 22-26 Mar. TX 137.777 QRSS20 on hour starting 2300. RX 135.922 kHz QRSS30 on half hour. Beacon QRSS3 starting at 0100. 23rd: QRSS3 copied by Hartmut. Sigs detected here from G3LDO. Dot20 Copied by G3LDO, CT1DRP but no trace of the dot3 at G3NYK, but M at G3LDO. Detected at W1TAG. 24th: Copied by H. Wolff again (Hartmut's copy at 0425UTC) but still no sign at G3NYK despite favourable conditions. 25th: Detected QRSS3 on CT1DP Screen grabs and another good copy from Hartmut. 26th: QSO's with G3DLO and M0BMU. Jim and Hartmut copied the QRSS3 beacon very well. (Jim's copy. Hartmut's was similar) Detected by RN6BN and DF6NM. 20-22 Mar. Beacon dot 15. Copied by M0BMU. 17-19 March 137.777 QRSS15 0100-1000 UTC. 19 Good copies by G3NYK and H. Wolff (2309-0600) 18 Good copy by H. Wolff. Detected by G3NYK. Sketchy but strong copy by H Wolff using QRSS30/Slow. Also G3NYK. 13 March. Weak copy at G3NYK good copy at CT1DRP along with traces of WD2XES. 12 March. The aerial was iced and the current was about 0.2 amps a result of detuning caused by the ice this morning. Copied by H. Wolff but very weak. 3-12 March. 2230 RX half hour. TX on hr. 0000-1000 Beacon QRSS30. 10th. Copied by G3NYK but not as strong as before. H. Wolff has reported copying the beacon from 1-9 Mar. but weakly on 9 March. Fade out at ~0600. 9th: Copied 0130-0800 by G3NYK but fading made early copy difficult. 6 Mar. Copied at RN6BN, G3NYK and CT1DRP. 5 March. WD2XES(W1TAG) copied at VO1NA on 137.728 kHz. John was using a 50' high by 60' loop, 11 amps, 100 watts. 3 Mar. A Good copy by RN6BN: best reception distance to date (6600 km - 1/3 way to the antipodes.) Also copied by PA0SE, G3NYK. 1-2 March TX 2300, 0000, 0100. QSX 135.922 on half hour for LDO. G3LDO started weak but ended strong -- on QRSS3! Copied by G3NYK. 1 March 137.777 QRSS30 2300-1000 UTC. 1.6 Amps 100 watts 1 wire. 27-29 Feb. Aerial up again. 1.6 amps 2200 UTC- 1000 UTC QRSS 30 Copied by G3NYK and PA0SE on 29th, H. Wolff and PA0SE on the 28th. A clear fragment was copied by RN6BN just before sunrise at about 0400 UTC. 27 Feb. Aerial iced and down again. Running 75 watts and 1.2 Amps. 22-26 Feb. 0000-1000. Still running on 1 leg but making the jump... Received by DF8ZR G3LDO and CT1DRP. Also by H. Wolff (JO52HO) and possible copy by RN6BN (KN95LC) on the 25th. (New record 6600 km). Also copied by G3LDO but not DJ8WX who had copy the previous days. 21 Feb 0000-1000 UTC at reduced power. Aerial freed from treetops but only one wire is up. Signal strength seems substantially improved during tests at 20 WPM from 1830-1950 UTC. 20 Feb. QRT during mains power failure. Could hear several commercial/military sigs from 120-145 kHz while the AC buzz was off. LOA from Industry Canada (Thanks to RAC) for extension to 20 Feb 2005. Horray! 18 Feb QRT. 19 Feb. 0000-1000 Reduced power. 16-17 Feb on 2300-1000. Reduced power. Traces at PA0SE and CT1DRP. 10-13 Feb on 0000-1000 UTC at reduced radiated power. 8-9. Feb Half aerial at half height. QRSS30 at 2300 (7 Feb) 70 W 1 Amp. Copied by W1TAG , G3AQC and by G3LDO at 0400 and CT1DRP at 0730 and only a 'vague trace' at G3NYK. G3LDO was clearly received here. 4-7. Feb QRT but QSX 135.922 kHz while tower/aerial repairs in progress. 2 New guys were attached to the uppermost section of the tower following a terrifying but refreshing climb to the top on the 4th. 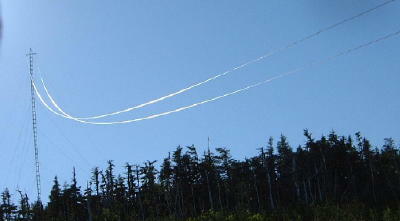 The LF aerial remains tangled in the treetops despite several trips on snow-shoes to recover it. WX: heavy snow -- wires not visible. 3 Feb. on at 0100 but most of aerial on ground on deep snow. Current about 0.5 amps, power 50 watts. 2 Feb. QRT as of 1000 UTC. WX damage. Copied by G3NYK mostly weak. 28-31 Jan. QSX on half hour TX on hour dot 20 starting 2200. Beacon after. Good copy for most of the morning on 30 Jan by G3NYK. Also copied by G3AQC. 31 Jan. Copied again by G3NYK. 27-28 Jan. QSX QRSS30 135.922 2130 2230 2330. TX QRSS20 137.777 2200 2300 0000 QSO with G3LDO! Copied by M0BMU, G3NYK and partial by PA0SE. Below is Peter's reply to the signal report sent from here. 26 Jan. 137.777 kHz QRSS30 starting 2200 UTC. Copied by G3NYK, G3LDO. Detected by PA0SE and seen on CT1DRP grab. 25 Jan. Recovered 100m leg from treetops. Running on both legs tonight starting around 2200 UTC. A clear copy by G3LDO at 0530. 17 Jan. Aerial trouble. One side entangled in treetops. Loaded up the remaining side. QRV as before at reduced signal strength. 13-16 Jan QSX QRSS30 135922 2130 2230 2330. TX QRSS20 137.777 2200 2300 0000 QSX CT1DRP, G3LDO, OM2TW, RU6LA, et al. 16 Jan. Good copy by CT1DRP on 14th until 0840. 10 Jan Beacon on 2017 at dot 30. 8 Jan Sent VO1NA K at dot 20. Nil on 922. My sigs were just a blur on Brian's CT1DRP argo grabber so went QRT at ~0100 UTC. 7 Jan dot 30 beacon 137.777 kHz 0000-1000 UTC. 1 Jan 2004. 1530-2020 TX 137.777 kHz at 20 WPM for local reception tests. Please note that signal reports and frequency measurements are appreciated. Jan-Feb 2003 -- An experimental proposal is developed in consultation with officials of Radio Amateurs of Canada and submitted to Industry Canada. MRCN members copy transatlantic commercial and amateur signals on 2200 metres. 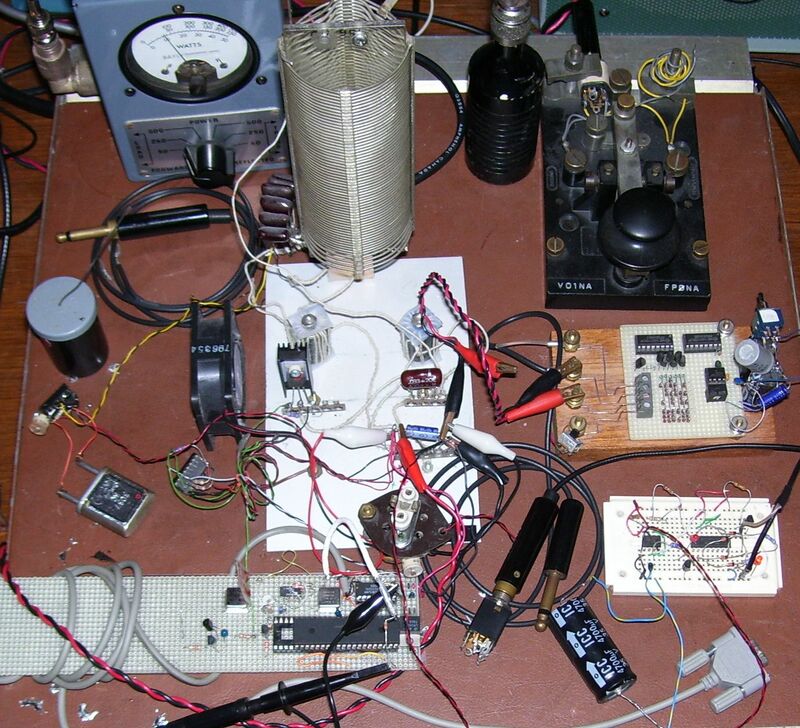 The first amateur radio signals received from Europe were from Brian CT1DRP. March -- Experimental authorisation granted by Industry Canada for CW and FSK emissions on a secondary basis. 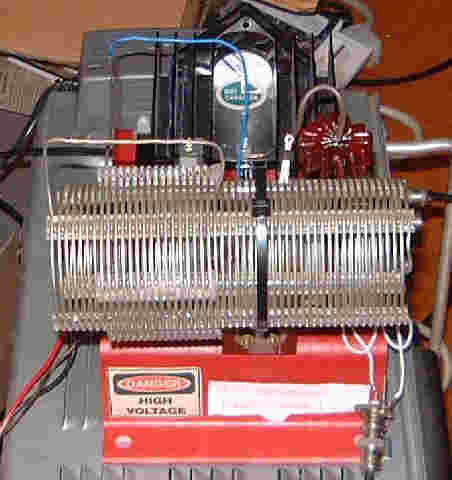 A 5 watt transmitter used for long wave experiments in 1992 was retuned for 136.269 kHz and coupled to a 30 metre wire aerial. Signals were heard 7 km away. A 15 watt class E tx is designed (per details at G3NYK) and built using a p-channel MOSFET. Cross band contacts were had with several MRCN members including VO1FB,VO1HP and VO1XP. The carrier was generated by a 13.583 MHz crystal in a Canadian Marconi XH100 receiver OCXO and digitally divided by 100 to give a carrier frequency of 135.830 kHz. A 150 metre wire aerial was deployed and signals are detected by W1TAG in Mass. about 1600 km away. April W1TAG positively identifies signals. Transatlantic tests commence. A 125 watt class E tx is designed and constructed. May -- MRCN Bridges the Atlantic on LF! G3NYK detects and identifies the signals. They are also copied by W1VD,W3EEE, M0BMU and CT1DRP. Signals are detected by VE3OT whose own transmissions were copied by MRCN earlier. 19 June. Copied on 137.77311 by W1TAG. Copied by W1VD. 21 June Copied by W1VD. 27 June. Several local stations copied the 20 WPM CW beacon on 137.777 kHz, including VO1RW and VO1HD, who had a cross-band QSO. Signals were also copied by VO1EGH and VO1RYN. 8 July. After a rough start and Pegelsender drift, the beacon signals were received clearly at CT1DRP G3YXM(0130-0345UTC) and M0BMU. W1VD and VE3OT experienced high levels of static. The operation was previously announced over the RSGB reflector. 9 July. Reception reports received from CT1DRP(very clear until about 0500) and M0BMU (0100-0330 UTC). 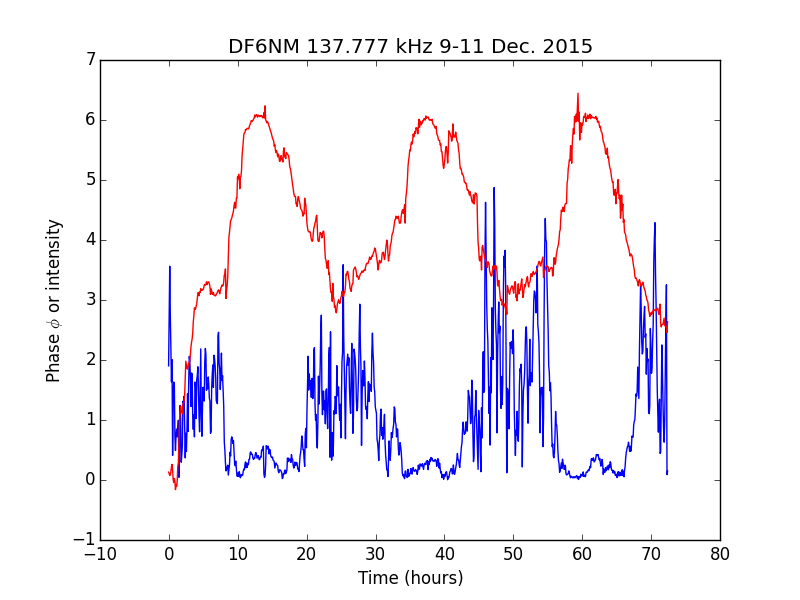 Traces detected by DF6NM and a clear "1NA" received at DJ8WX. 11 July. Copied by several EU stations, but not as good as yesterday. 15 July. Copied by M0BMU at 0330 one clear callsign then dawn fade out. 19-20 July. Traces copied by M0BMU. Not detected at KL1X. 23 July. More or less solid copy from 0120 to 0420 at M0BMU. 24 July. Traces at M0BMU. 25-28 July. Copied by M0BMU with 10-15 dB SNR on 26 Jul. 30 July. Detected by M0BMU 2340 and 0510utc Copied 0220-0340. 31 July. Detected by M0BMU 0210 - 0410utc in heavy QRN. Copied at 0350utc. 09 Sept. Detected by G3NYK in QRM. Copied by M0BMU. 10-11 Sept. Det. by G3NYK. 12 Sept. Identified by G3NYK. 16 Sept. Copied by G3NYK. W1VD and W1TAG reported frequency as 137.77693 kHz. 17 Sept. Traces reported by G3NYK. Conditions poor. CFH 15 dB down. 19 Sept. Fragments detected by KL1X. 20 Sept. Copied by G3LDO. 21. Nil at G3LDO, weak at G3NYK. CFH down 15 dB. 21 Sept. Fragments by KL1X, Weak at G3NYK. Detected by G3LDO. Good copy at W1TAG. 22 Sept. Copied at W1TAG, Detected at G3NYK. 23 Sept. T/M copy at G3NYK. 25 Sept. Almost full callsigns copied by G3NYK. 2 Oct. Good copy at G3NYK and G3YXM 0300-0700. Also GI8AYZ detected at 0352, good copy 0546 then still detected 0755 and also W4DEX and W1VD. 4 Oct. Det. 0115 O copy 0200-0530 M 0700-0800 T till 0845 G3NYK copied 0000-0740. O at 0500. 3 Oct. Good copy at G3YXM about 0500. Good copy G3NYK after 0300. 5 Oct GI8AYZ 2300 O; 0000 on M. G3NYK traces in QRN. 6 Oct GI8AYZ and G3NYK reported copies ranged from good to nil but generally poor from tx on time (0054) until 0845 and 0700 respectively. Call signs were copied by G4WGT, (0505-0630) M0BMU and PA0BWL. Good copy at G3YXM. 7 Oct Strong sigs when tx activated at 0120. Variable till 0620 good then fade out at G3NYK. Detected at 0145, faded 0430 visible 0540 fade out 0700 at G4WGT. 8 Oct. Good copy at 2300 (7 Oct) then faded Detected until 0830 at GI8AYZ M copy most of night but O at about 0500 at G3NYK. 9 Oct Good copies at GI8AYZ, G3NYK. 15 Oct. Consistent copy until 0600 at G3NYK. Very strong copy at W1VD. 17 Oct. Fragmented call signs copied by G3NYK throughout the night. 30 Oct. Copied during broad daylight at W1TAG during major geomagnetic storm. 31 Oct. M-to-O copy at M0BMU between about 0600 and some time after 0800 UTC. 05 Nov. Copied by M0BMU 0600 -0700 UTC. A record-breaking X28/3B solar flare took place on the 4th. 14 Nov. G3NYK reported a copy at 1200 UTC! 16 Nov. Good copy by G3NYK. 5 Dec. Copied by CT1DRP, GI8AYZ G3YXM. 7 Dec. Copied by DF6NM. 15 Dec. Copied by M0BMU. Very clear. 16 Dec Solid copy by G3NYK, W1TAG. 28/29 Dec. Detected by G3NYK in noise. 29/30 Dec. Copied by G3NYK in noise. Detected by DF6NM. The 125 watt beacon has been transmitting QRSS30 on 135.830 kHz since 0000UTC 01 June 2003. Off as of 0000 UTC 2 June. Will resume operation at a later date when geomagnetic conditions improve. VO1NA will be transmitting QRSS30 on 137.777 kHz at 0000 UTC 12 June 2003 in an attempt to make a 2-way contact with M0BMU who will be transmitting on 135.922 kHz. Off at 0313 UTC. 0000 UTC 13 June. Resume QRSS30 on 137.777 till 0900 UTC. 0000 UTC 14 June on until 1045 UTC. 0000Z 15 June on until 0900Z. 0000-0900Z 17 June. 137.7730 kHz. QRSS30 Conditions very poor, but KL1X is listening in 9G. Again 19 June. 137.7735 Looks like the Pegelsender is drifting again. 25 June 0000-0900 137.7735 kHz. 26 June QSY to 137.777 kHz. Usual times. Off air 1000Z 27 June. 27-30 June Beacon CW at 20WPM for local tests. 137.777 kHz. 15 July 2111-2206 UTC. 20 WPM QRP (3 watts) on 137.35 kHz. 16-31 July 0000-0900 UTC. QRSS30 137.777 +-0.0002 kHz. at 100 watts output. Off air on 137.777 kHz until a new crystal arrives. 1 Aug. Brief experiments on 135.830 kHz. 13 Aug. Still awaiting xtal. Pegelsender in basement. Local reception experiments on 135.830 kHz. 27 Aug. The xtal for 13.77770 MHz has arrived and has been tested. Beacon operation will resume in about a week on 137.7770 kHz. 4 Sept. Local reception experiments on 137.7770 kHz. 13 Sept. Off air while attempting to copy ZL6QH. 13-14 September. On air at 20 WPM CW for local reception experiments. Heard in Harbour Grace and Whitbourne with good signals. 16-17 Sept. QRSS 30 137.777 kHz +-0.2 Hz starting 2300 UTC. QSX 135.922 kHz. 18 Sept. QRSS 30 137.777 kHz starting 2300 UTC. Frequency adjusted. It appears to be 137.77699 when compared against the LORAN line at 137.77854 kHz. W1TAG reported the same frequency. Agreement within 0.1 ppm! 19-21 Sept. On again. 2300-1000 UTC. Dot 20 at 2300, 0000, then dot 30 beacon. 22-24 Sept. 137.7770 kHz 2300-1000 UTC QRSS 30 beacon. 26 Sept-4 Oct. As above. 5,6 Oct QRSS20 2300,0000 QSX 135.922 on half hour. 0300 Beacon QRSS30. 12-17 Nov 24 hour operation until 1000 UTC 17 Nov. QRS30 137.7770 kHz. 6-7,9 Dec. 2300-1100 UTC 8,10 Dec off air. 12-18 Dec 0000-1200 UTC. Off air 19 Dec.
21 Dec on at 0046 UTC 137.777 kHz QRSS30. 27 Dec Local reception tests at 20 WPM 1600-0045 UTC. 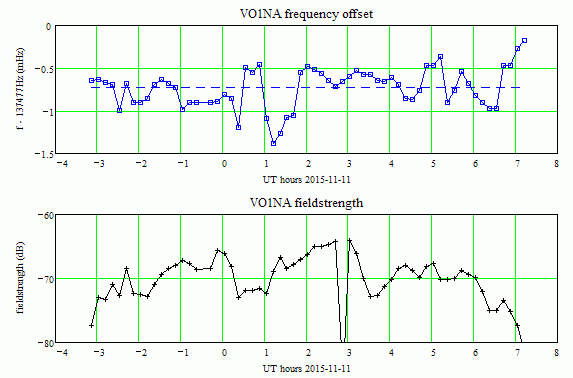 TX frequency check: A 0.07 Hz upward drift was observed and corrected using a nearby LORAN line. Listening (watching) for Long Wave signals. You will need a program called Argo by I2PHD and IK2CZL. 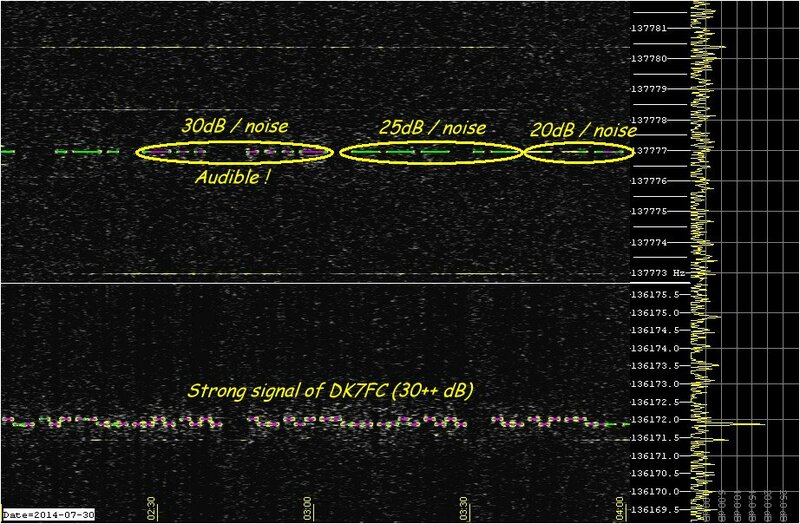 Argo is an advanced FFT spectrum analysis package that will make it possible to detect and copy signals that may not be audible in the high noise. There is a well written primer on how FFT works and bandwidth/information theory in very simple terms at this site. Another excellent product is Spectrum Lab. For receiving, a piece of wire is not especially useful for weak signals on LF unless it is carefully tuned. Without tuning, it has an enormous Xc and negligible R unless it's 100's of metres long. Tuned loops are the way to go. They are typically 5 feet square with 15 turns and resonated with a 1000pf trimmer cap. I use a coupling turn and connected it with coax to an FT-817 through a Burhans (30-35 dB) preamp. DCF-39 (50 kw FSK station in Germany) could be heard on 138.830 kHz without a preamp. The 817 and many other amateur transceivers are quite deaf below 500 kHz, but are stable enough in frequency. Several club members have heard DCF39 and some have received it using a wire (or shorting the near end of the feeder on an 80m or trap dipole and using it as an antenna) but the loop is usually better in terms of signal to noise. DCF39 can be recognised as a continuous carrier, interrupted at irregular ~10 second intervals by a 1 second FSK transmission. If you can hear DCF39, you have a good chance of seeing amateur signals on 2200m with ARGO. Alan G3NYK has an excellent site, complete with propagation information and an easy-to-use spreadsheet implementation of Sokal's Class E Amplifier design equations. There are several other excellent sites on the internet, for instance ON7YD. More sites and a list of other Canadian LF experimenters are available at Steve's VE7SL site Steve's old site Propagation info and forecasts can be seen at Alan's G3NYK Propagation page. To keep up-do-date on the latest in the world of Amateur LF, see the G3YXM LF News site. Or register for the RSGB LF reflector. Ed RU6LA has been keeping track of 2200 m DX records . Hartmut Wolff (Germany Locator: JO52ho) Maintains a web page with images of his latest captures including many transatlantic receptions.